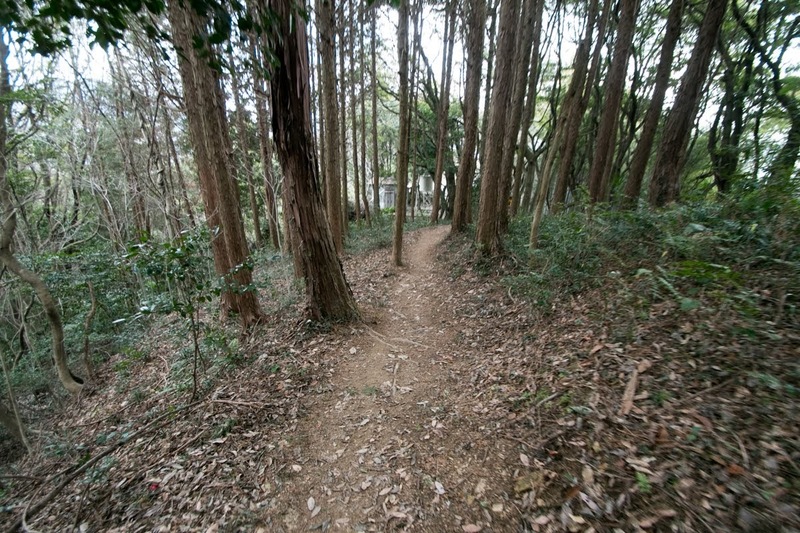 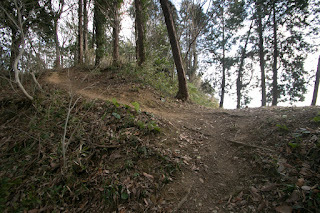 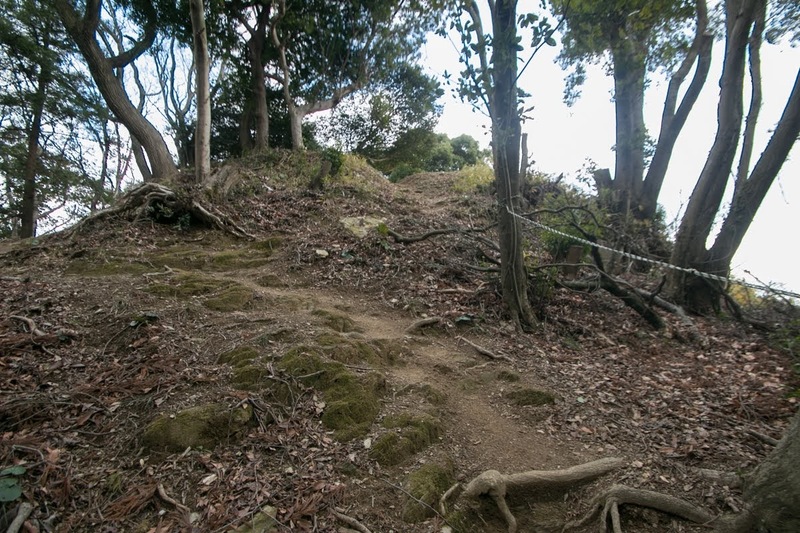 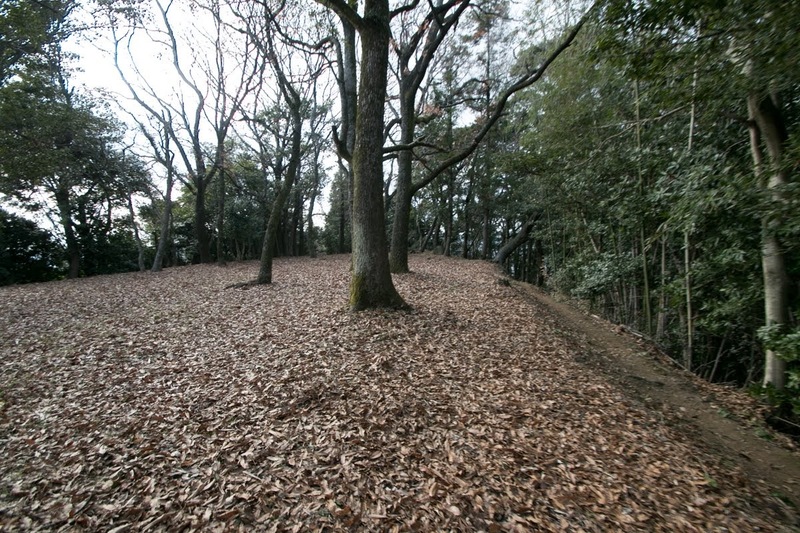 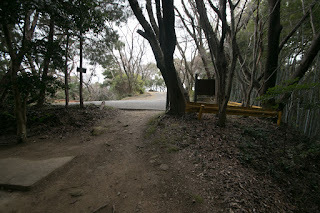 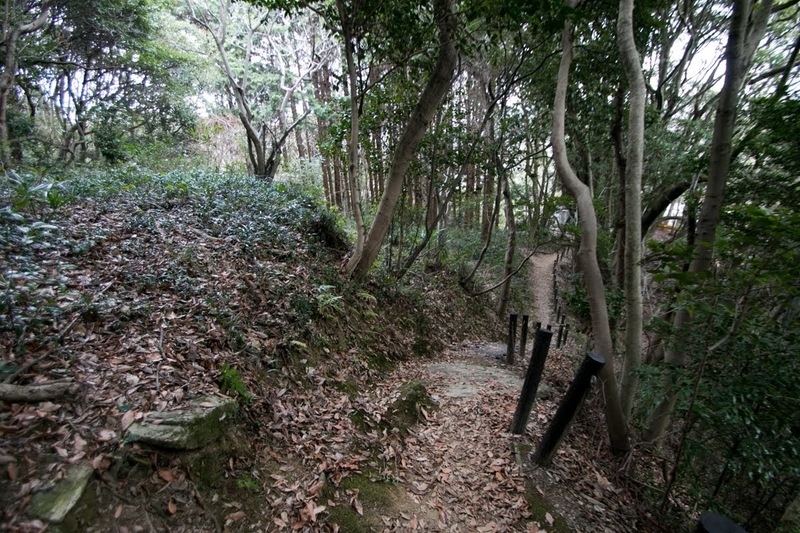 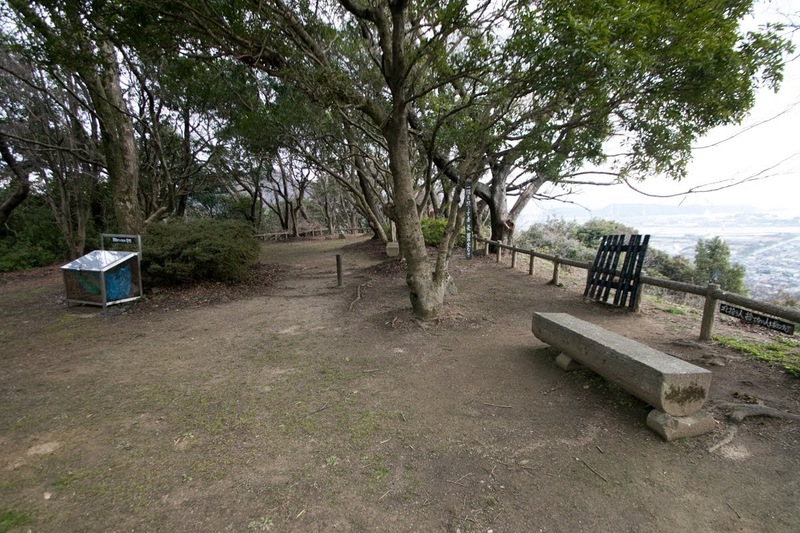 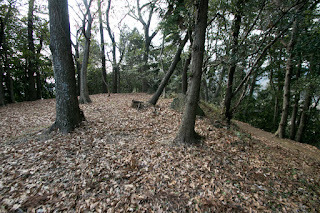 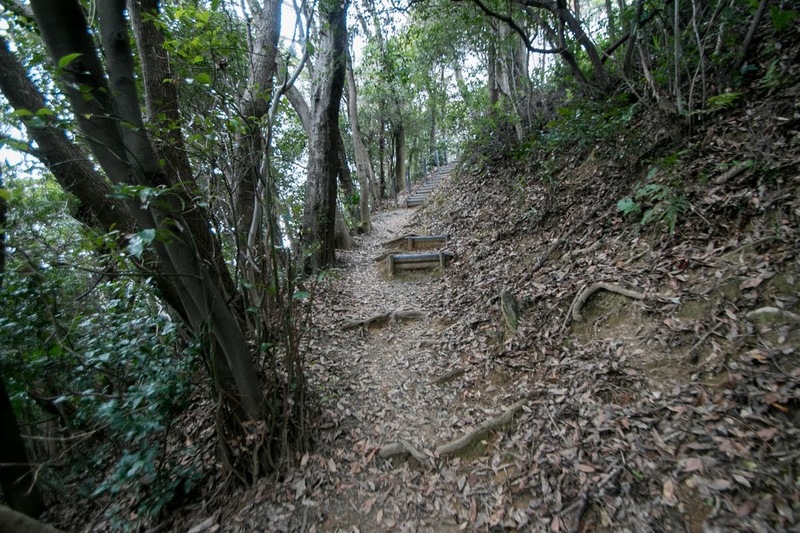 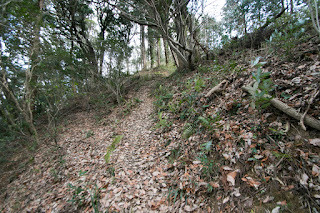 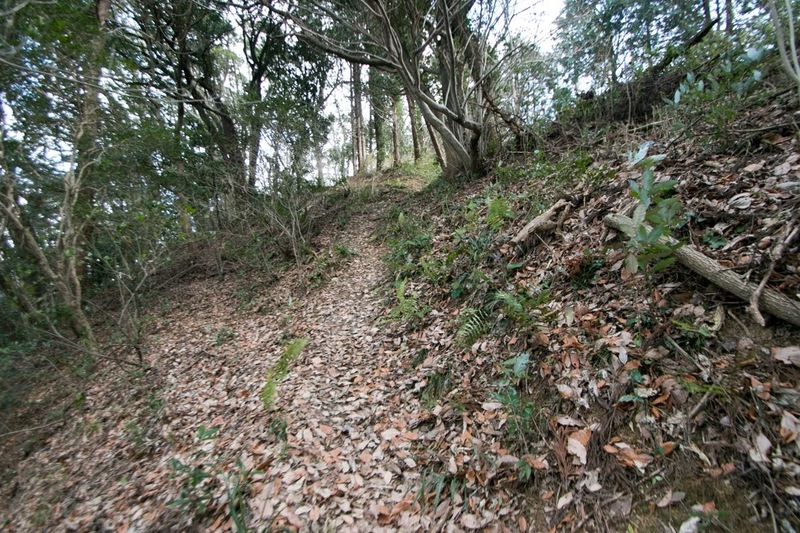 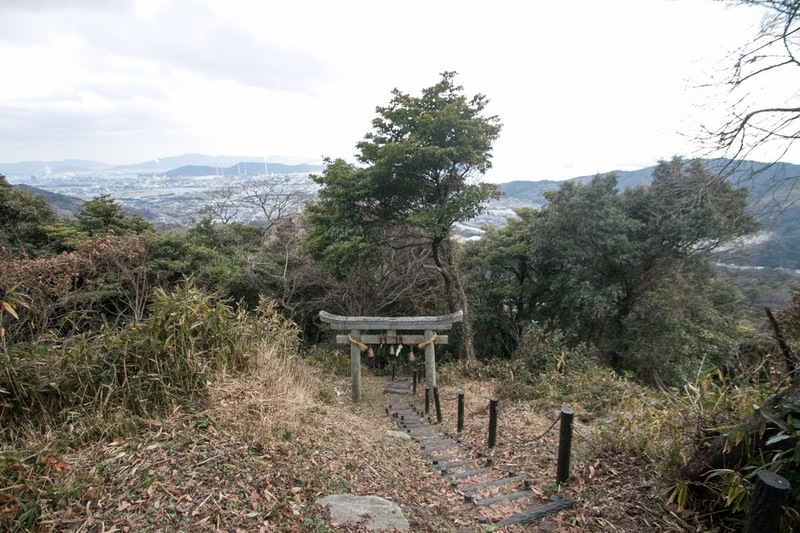 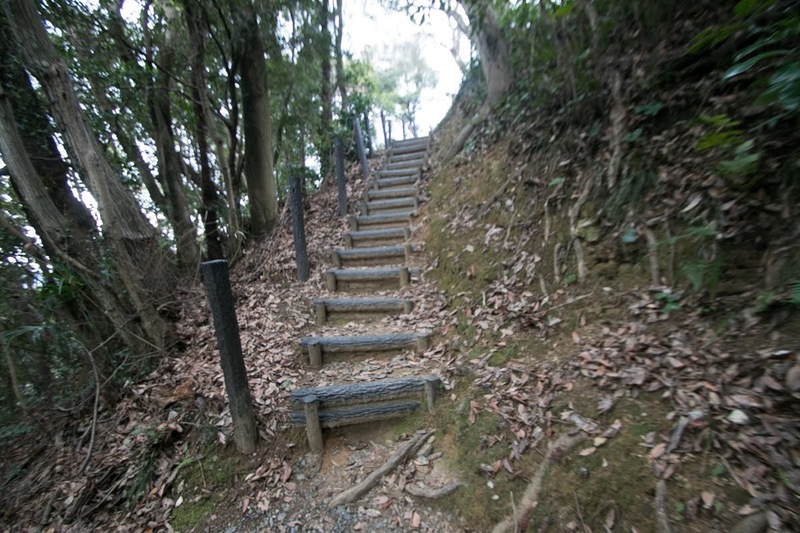 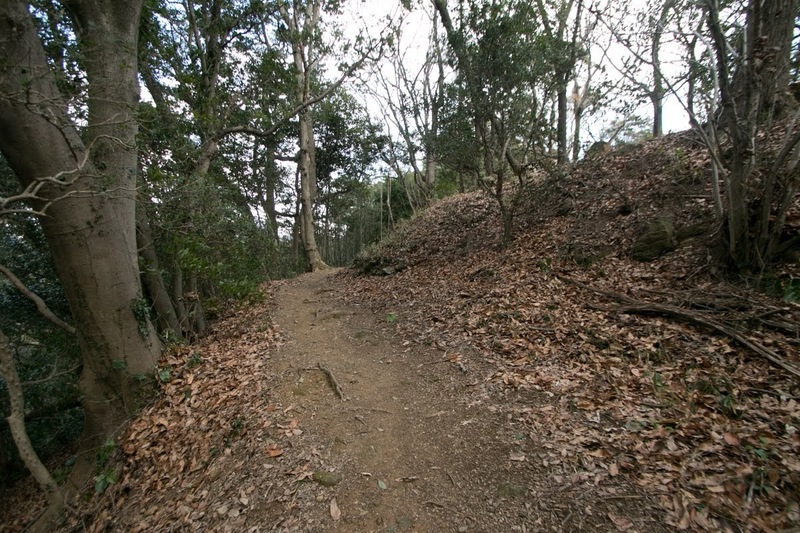 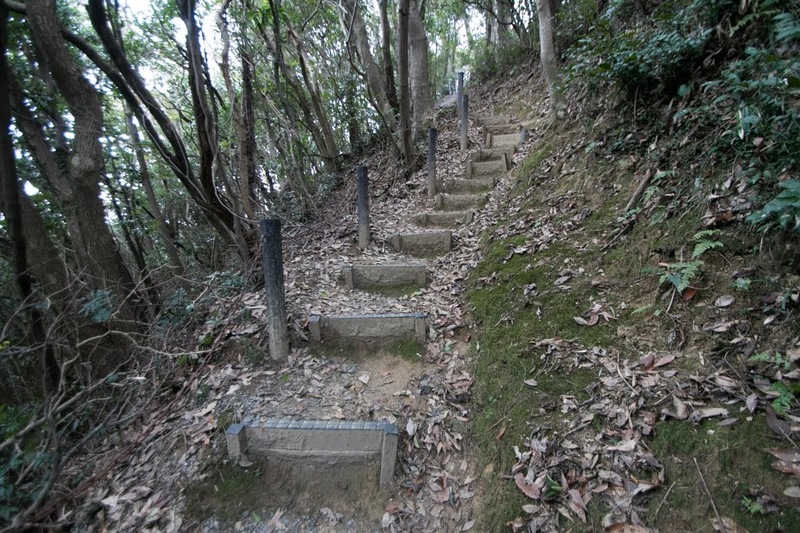 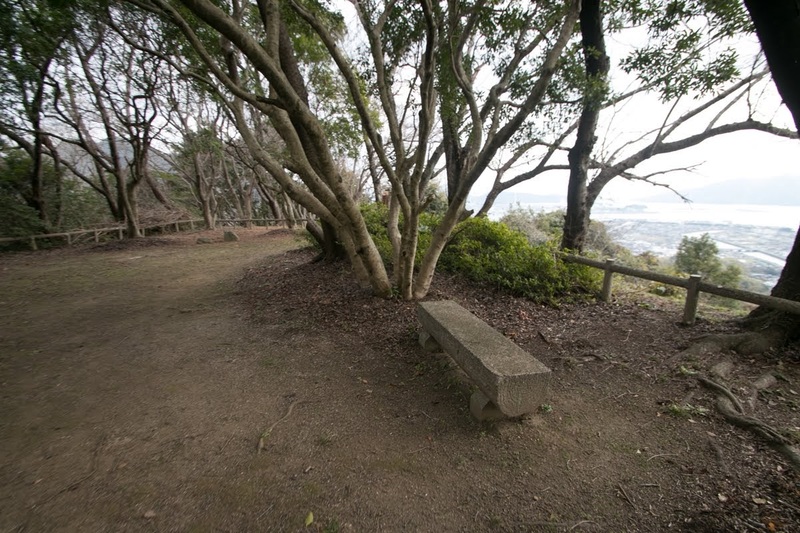 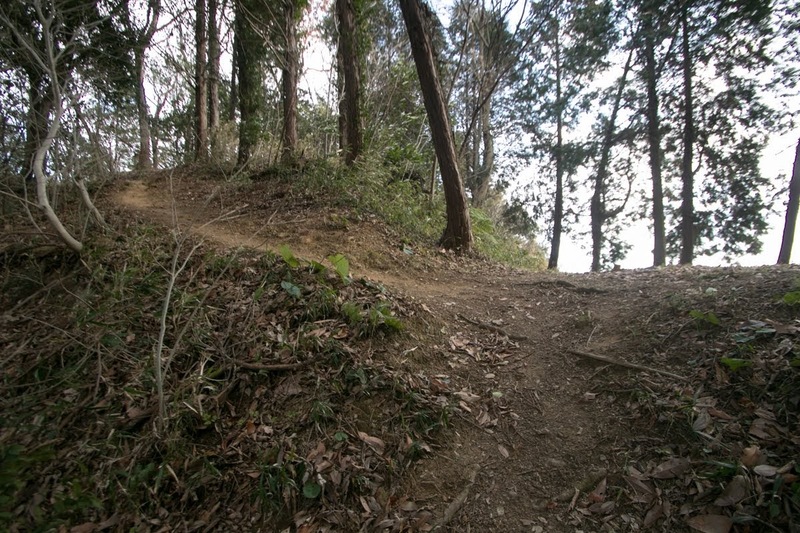 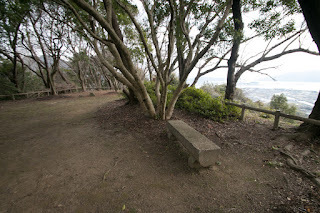 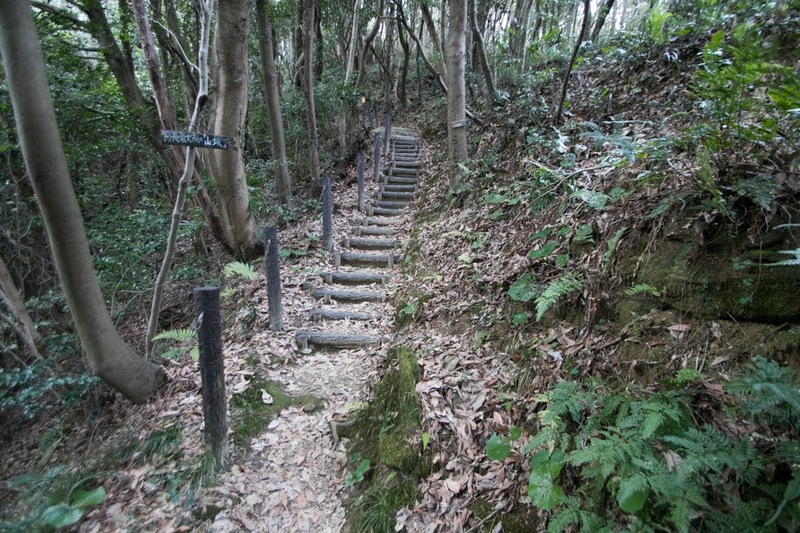 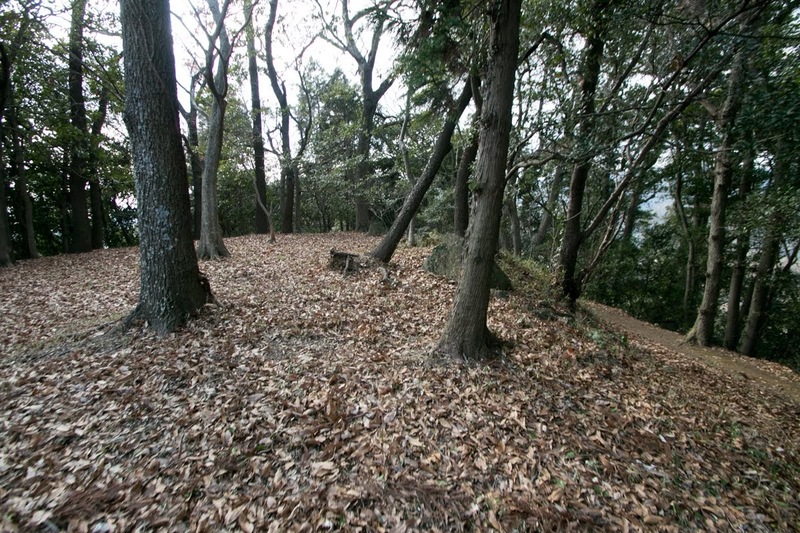 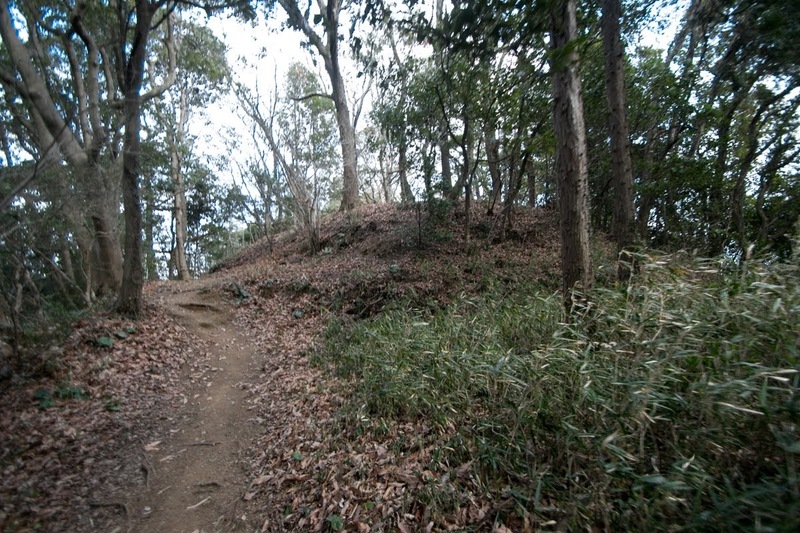 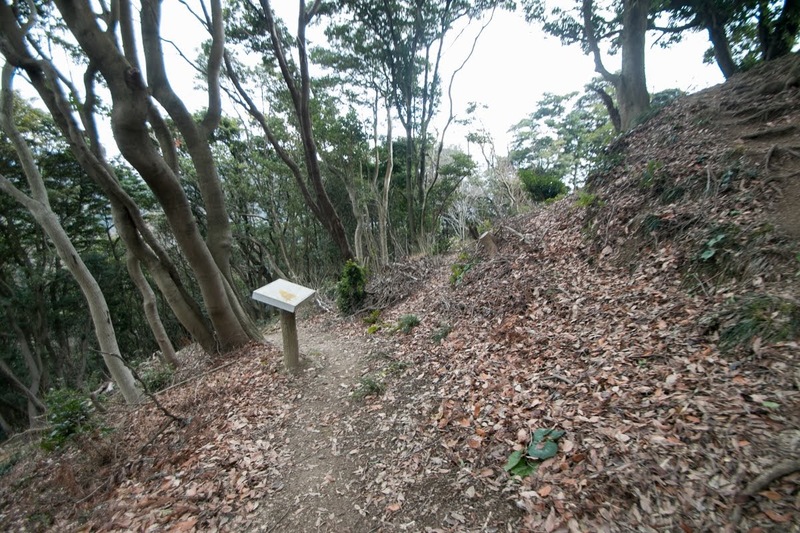 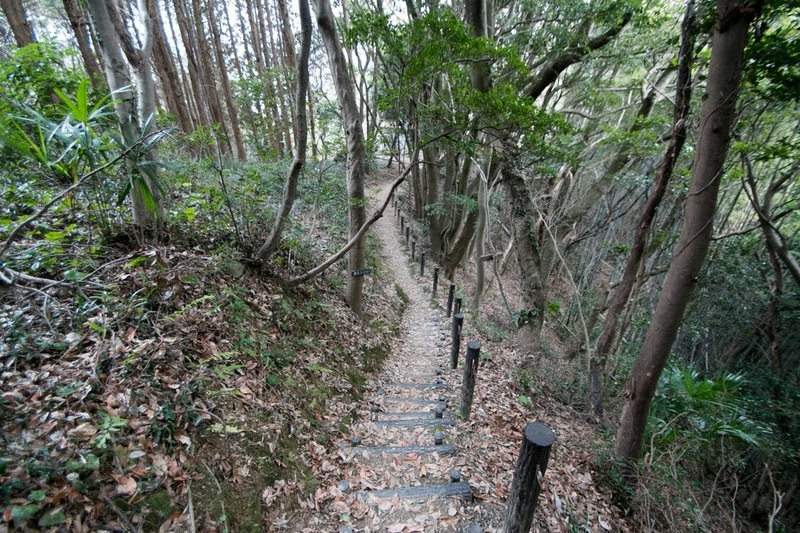 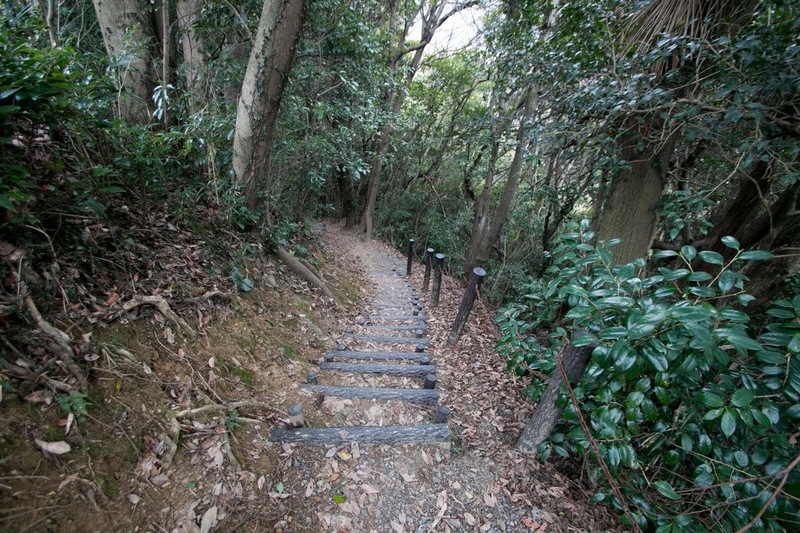 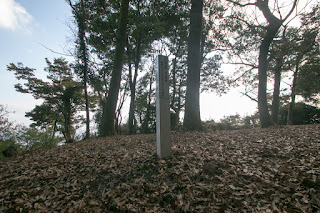 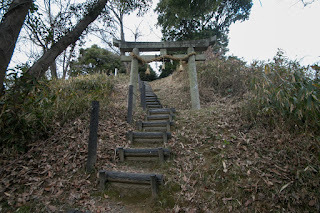 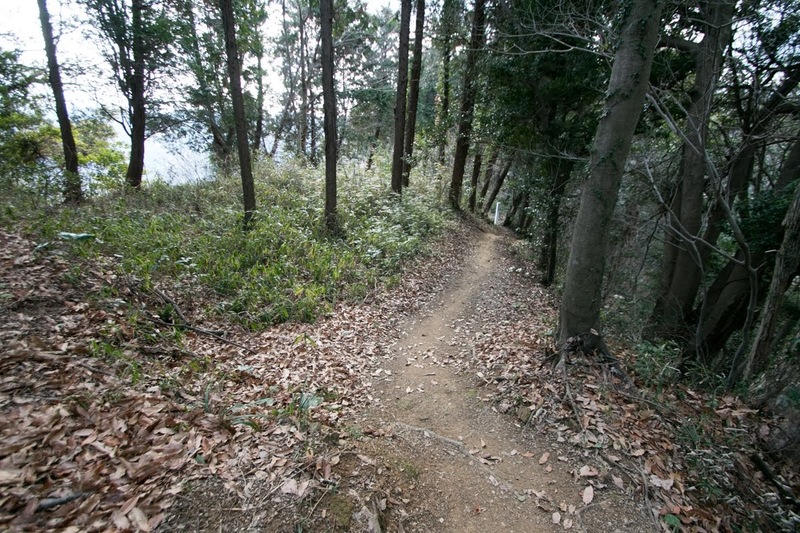 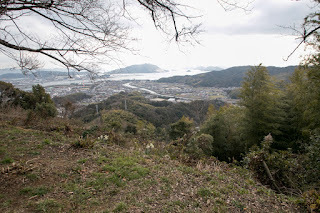 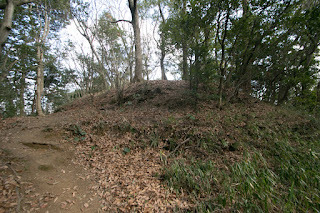 Suo Wakayama castle (周防若山城) is located at Wakayama mountain, one of 200 meter height from hillside faces Yoichigawa river at the western edge of Shunan city. 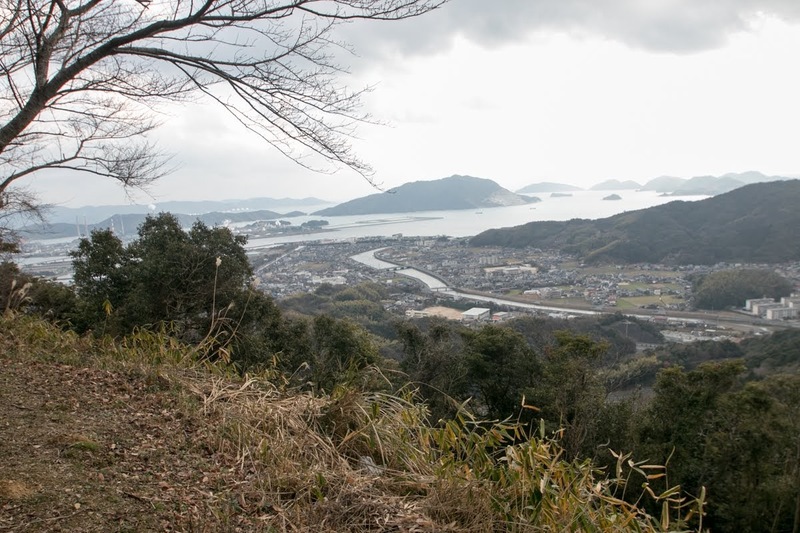 Shunan area is a flat area spreads along Setonaikai sea, and prospers as a town of petroleum and chemical complex utilizing good port protected by islands. 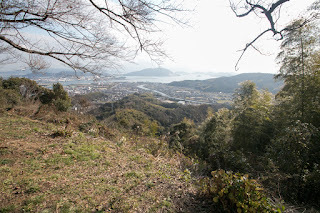 Shunan area is also at the middle of Iwakuni area which was the eastern border of Suo province (eastern half of Yamaguchi prefecture), and Yamaguchi area and Hohu area, the core area of the province, thus it was an important place to protect Yamaguchi area and Hohu area from eastward. 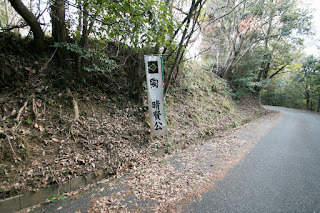 Even now important roads, highway and railways passes near castle site. 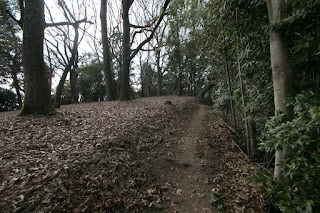 Suo Wakayama castle was built by local lord Hiromori Sue (1455-1482) around 1470. 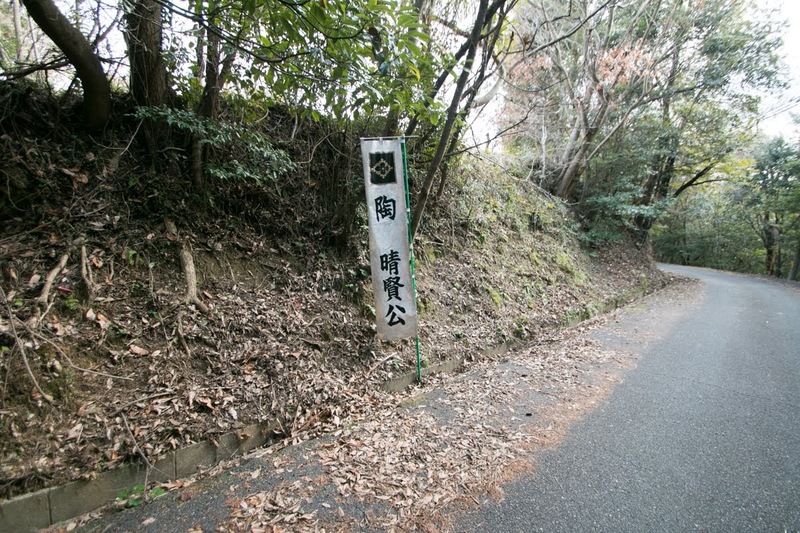 Sue clan was originally a branch family of Ouchi clan, a strong governor house of Suo province and Nagato province (western part of Yamaguchi prefecture). 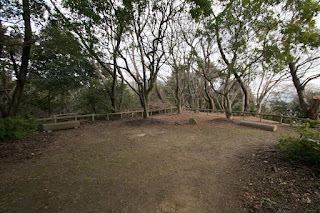 Ouchi clan was a traditional family which claimed as a descendant of ruined Korean Peakche kingdom, and they supported Minamoto clan at the establishment of Kamakura Shogunate then became the local lord of this area. In Muromachi era, Yoshihiro Ouchi (1356-1400) activated at many battles under Yoshimitsu Ashikaga (1358-1408) and got large territory. 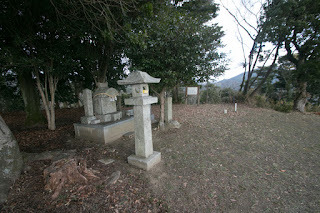 Yoshihiro also focused to foreign trade with Chinese Ming dynasty or Korean Koryo kingdom, but was bewared for his power by Yoshimitsu then raised his army against Shogunate in 1400 but was defeated and died in the battle. After this defeat Ouchi clan once lost their territory except for Suo province and Nagato province. But utilizing the conflict between Kyushu Tandai, the representative of Muromachi Shogunate at Kyushu island, and non obedient local retainers, Ouchi clan advanced into north part of Kyushu island such as current Kitakyushu area or Fukuoka area, fought with neighbor strong lords such as Otomo clan or Shoni clan, and virtually held this area. 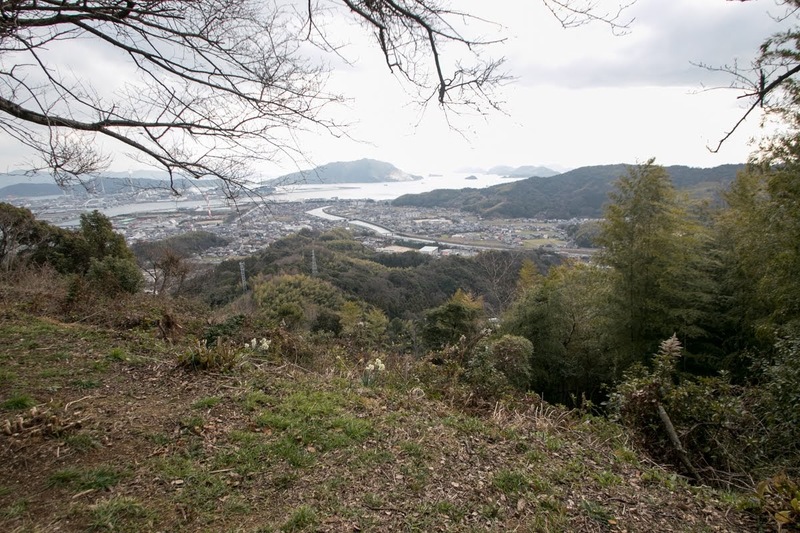 Ouchi clan also seized Hakata port, the largest trading port at that time, and earned huge profit from trade with China and Korea. 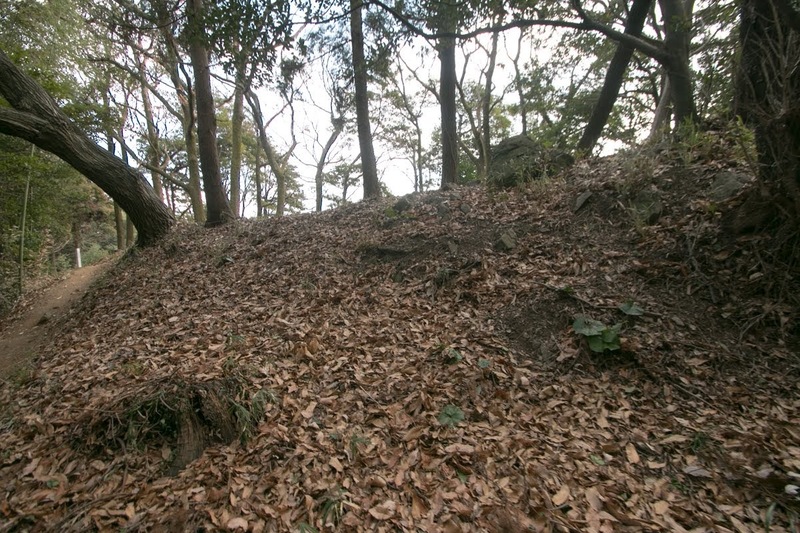 Looking at the strength of Ouchi army, opposite Hosokawa clan made a plot to let a relative of Masahiro to raise an army against Masahiro, along with local lords such as Yoshimi clan at Tsuwano castle. 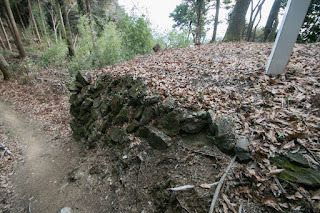 At that time Hiromori Sue defended the absence as a deputy governor built Wakayama castle to secure Yamaguchi city and tenaciously fought with rebellion army and finally suppressed it. But Hiromori was later assassinated by Yoshimi clan, and it could be the purge by Ouchi clan which feared the power of Sue clan. 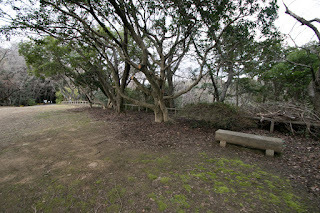 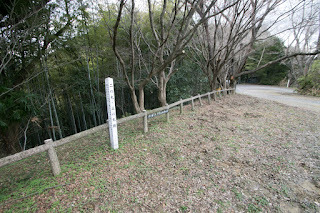 Yoshioki stayed Kyoto city for 10 years and continuously fought with Hosokawa clan and Miyoshi clan which aimed at recovery of Kyoto city, but finally had to return because of dissatisfaction of retainers for long campaign and attack to vacant main territory by Tsunehisa Amago (1458-1541), the warlord of Izumo province (eastern half of Shimane prefecture). 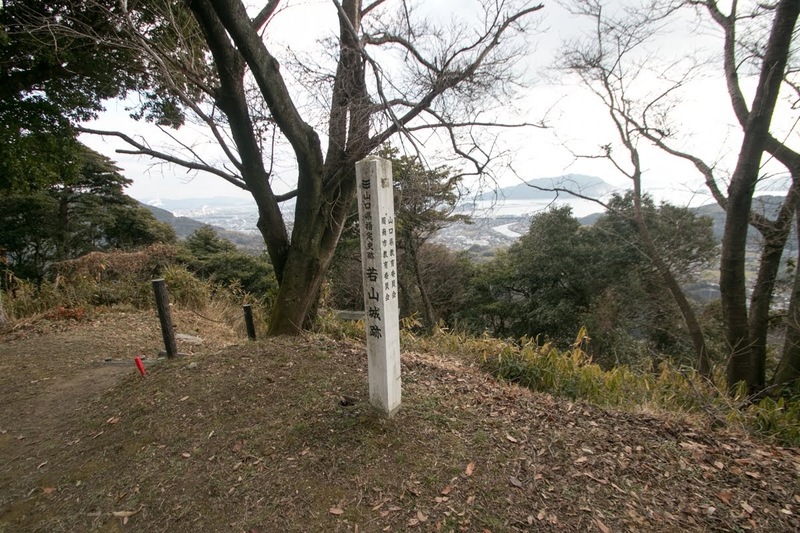 But after its return Otomo army beat Shoni clan and captured most part of north part of Kyushu island, and Otomo clan was regarded as the strongest warlord in western Japan. Based on their military and economic strength, Yamaguchi city which was the capital of Ouchi clan made an unprecedented prosperity and said as western Kyoto. 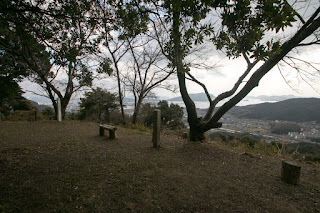 Apart from war-tone Kyoto city, many nobles and cultural people visited Yamaguchi city and lived. Among them, Sesshu (1420-1506), a Zen monk and ink painter who studied at Ming dynasty, left excellent works around the territory of Otomo clan. 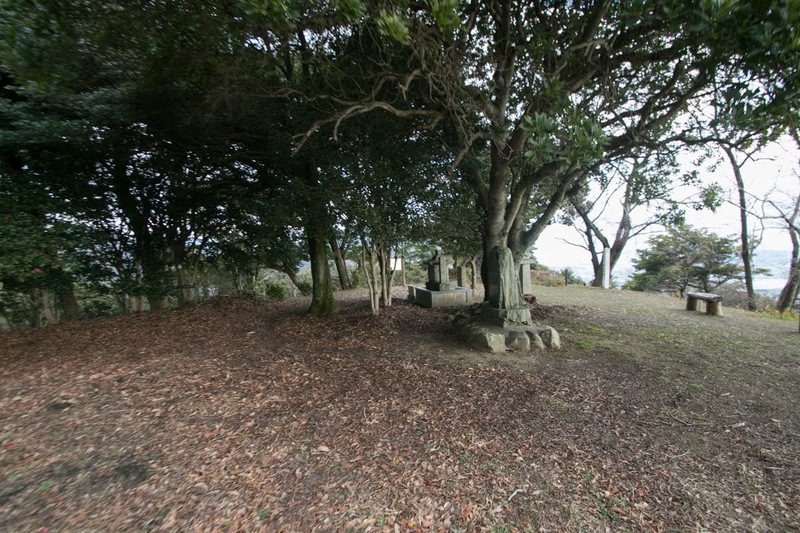 Later Francisco de Xavier (1506-1552), the first Catholic missionary came to Japan, visited Yamaguchi city and built the first church here. 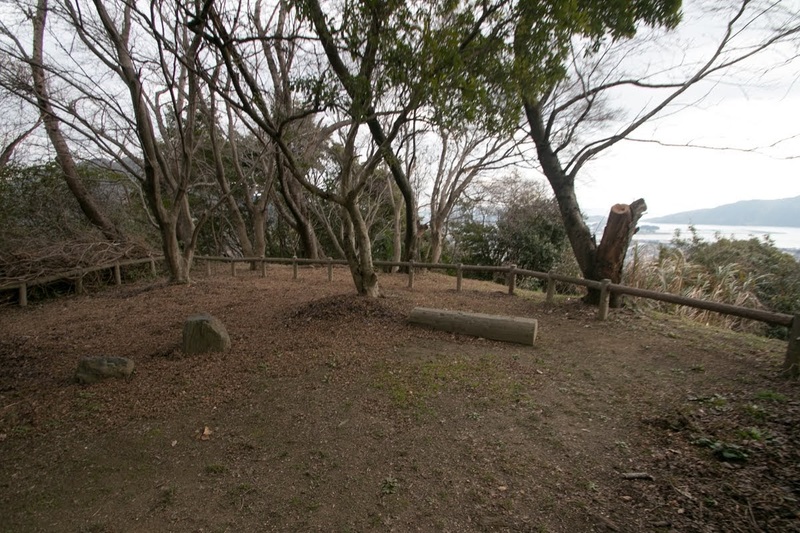 But apart from its appearance, actual situation of the clan became worth. 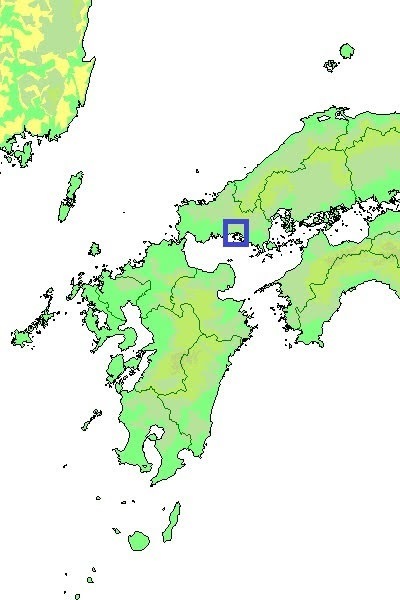 In 1523, trade ship of Ouchi clan and Hosokawa clan conflicted at Ningpo port at China, then official trade with China was limited from then. 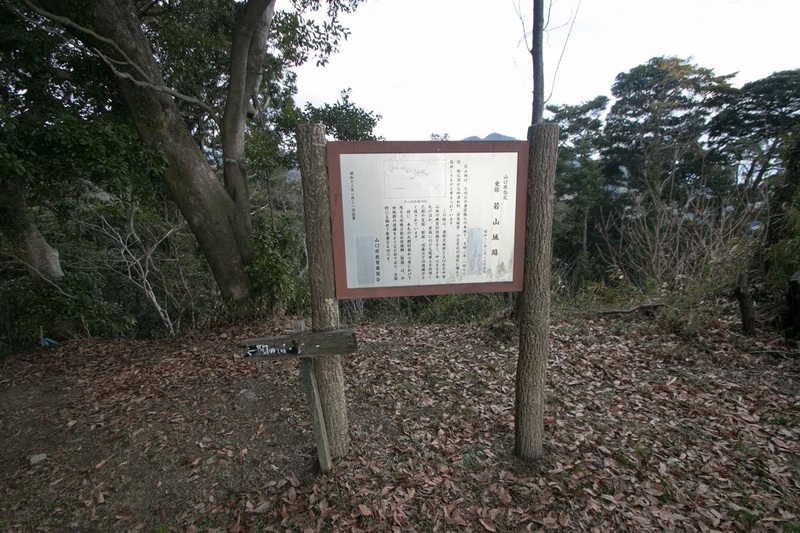 Originally the territory of Ouchi clan was separated into small basins by mountains, and local lords kept certain independency. To enable long expedition Otomo clan had to allow the power of such local lords. 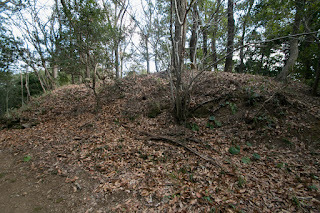 especially for Sue clan which was the core troop of the army. In addition to this, same as Asakura clan at Echizen province (Fukui prefecture), excessive devotions to the culture sometimes brought indifference from military affair or conflict between staffs of the lord and front side generals. In 1528, Yoshitaka Ouchi (1507-1551), substantial last leader of Ouchi clan, became the leader of Ouchi clan. 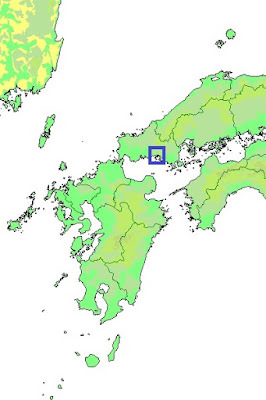 At first 10 years, Yoshitaka succeeded expansion policy from his father and aggressively held military operations at north part of Kyushu island. In 1540, Haruhisa Amago (1514-1561), the warlord of Izumo province, lead large army and attacked Motonari Mouri (1497-1571) who later became the ruler of Chugoku region but still was a small lord under Ouchi clan at Yoshida Koriyama castle (Hiroshima prefecture). In response to the invasion of Amago army, Yoshitaka sent Harukata Sue (1521-1555), the leader of Sue clan, as a grand commander of reinforcement army. 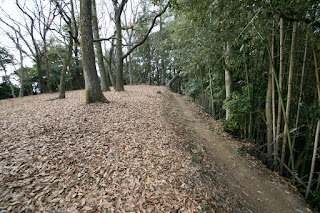 Harukata defeated Amago army which tired at siege of Yoshida Koriyama castle firmly secured by Motonari, and gave a substantial damage to Amago army. 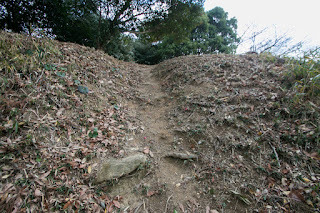 After that Harukata participated in the siege of Kannabe castle (Hiroshima prefecture) and worked as a main force of Ouchi army. 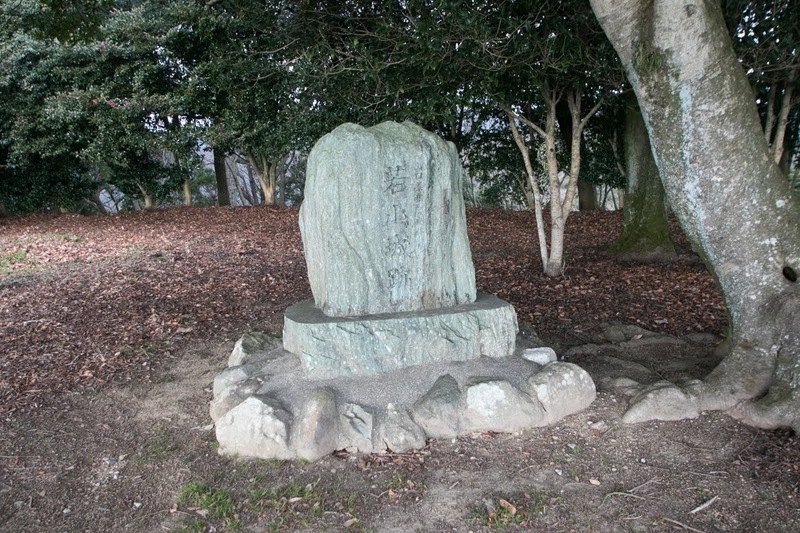 As a leading general of strongest clan in the western Japan, Harukata was praised as "unprecedented general in the west". But at the same time, his master Yoshitaka Ouchi failed in the siege of Gassan Toda castle (Shimane prefecture), the main base of Amago clan, in 1542. 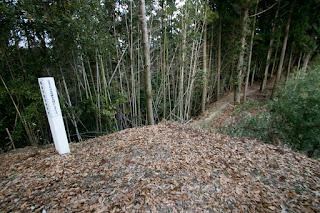 At this battle Yoshitaka lost his successor, then lost his interest in governance, fell into culture and let the politics to his staff Taketo Sagara (1498-1551) who was good at culture and administration. However, from another aspect, this might mean Yoshitaka tried to centralize diversified Ouchi army and decrease the power of strong retainers such as Harukata Sue. 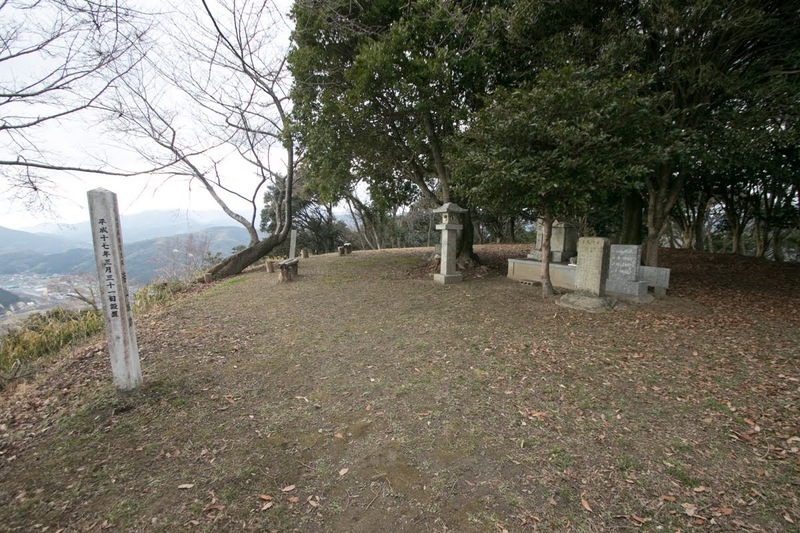 Anyway Harukata became hostile to Taketo Sagara and Yoshitaka Ouchi, especially formerly Harukata was intimate to Yoshitaka as a valet. Anyway Harukata withdraw to his territory and reformed Suo Wakayama castle expecting the battle against Ouchi clan. 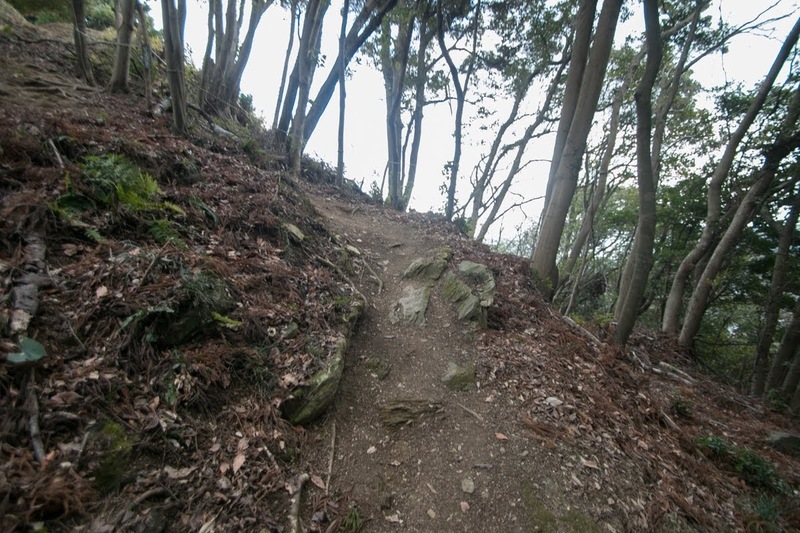 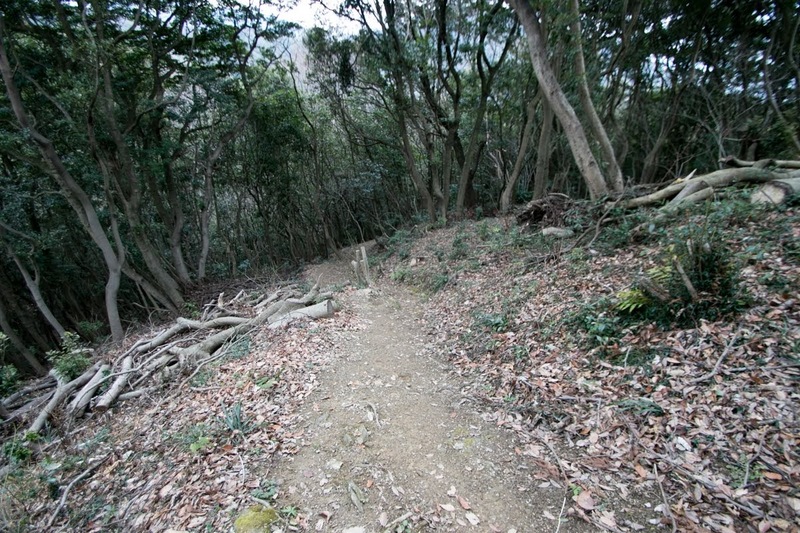 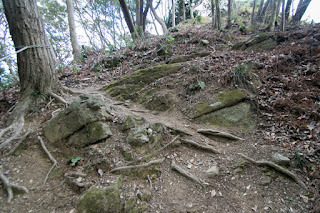 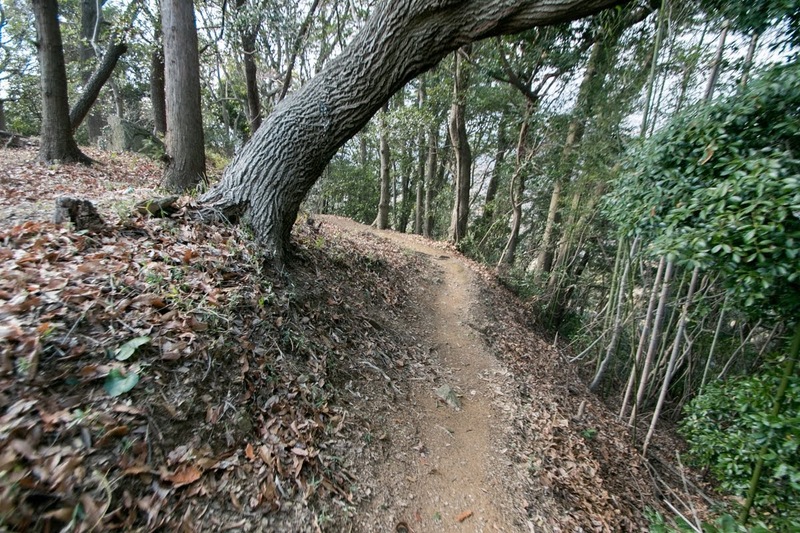 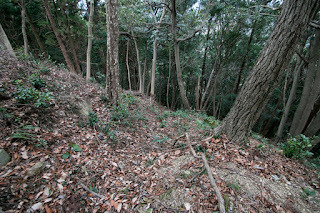 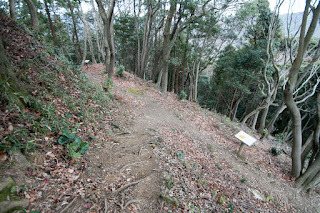 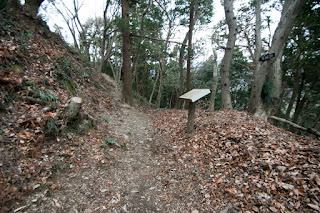 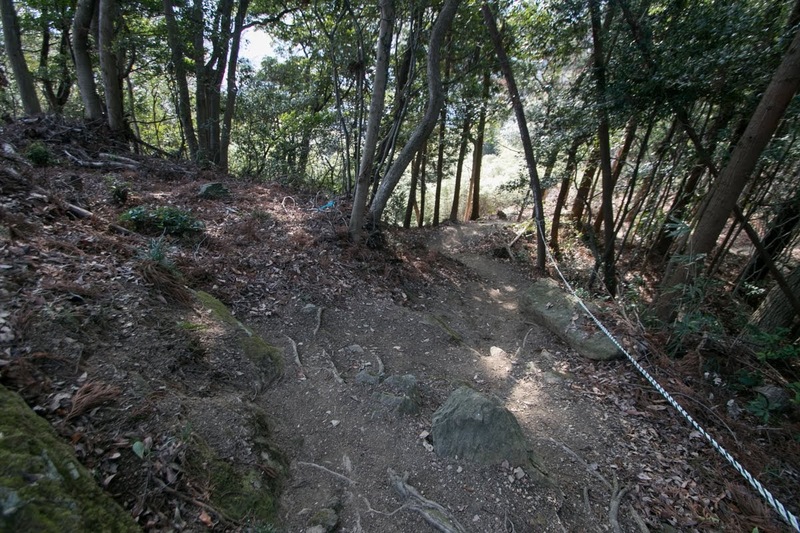 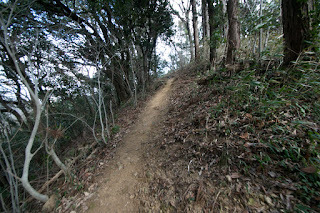 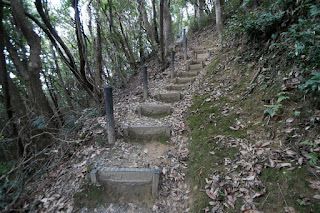 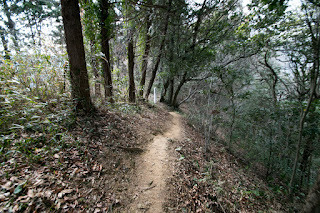 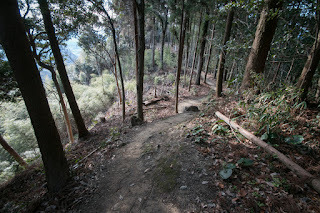 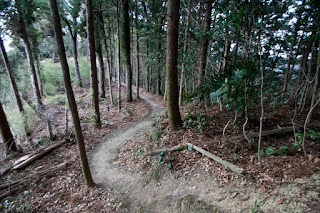 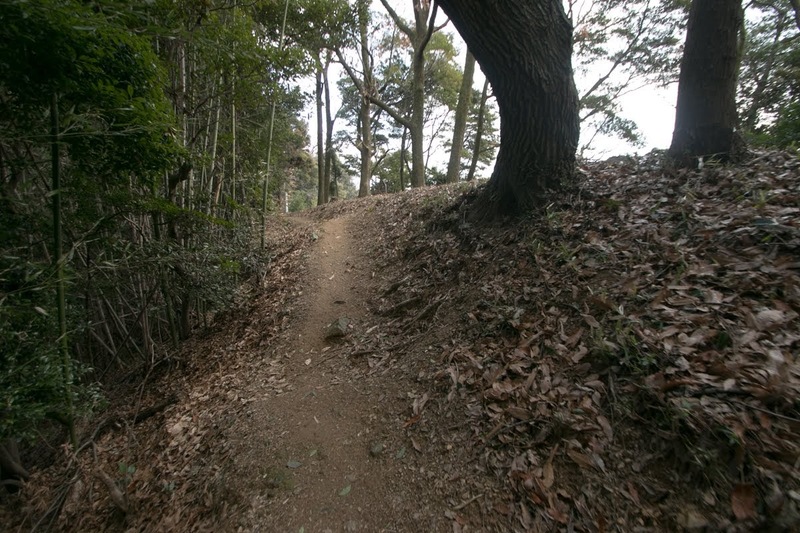 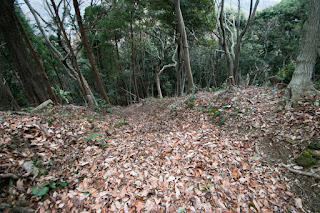 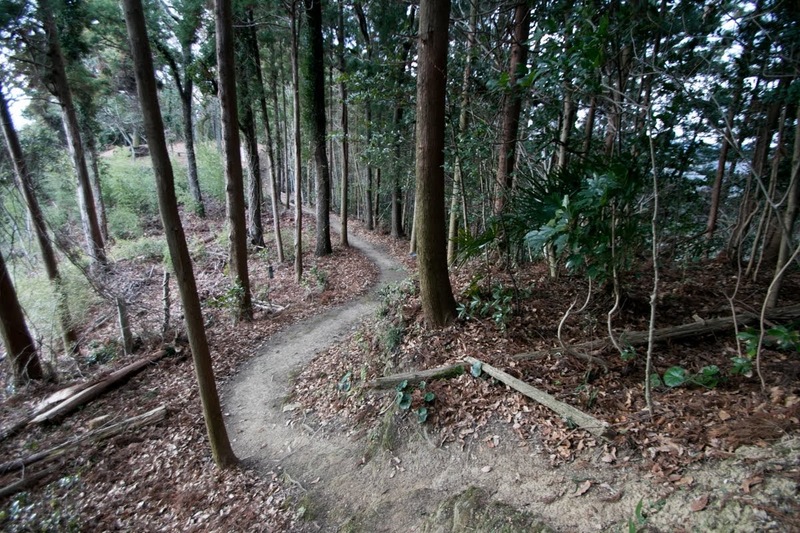 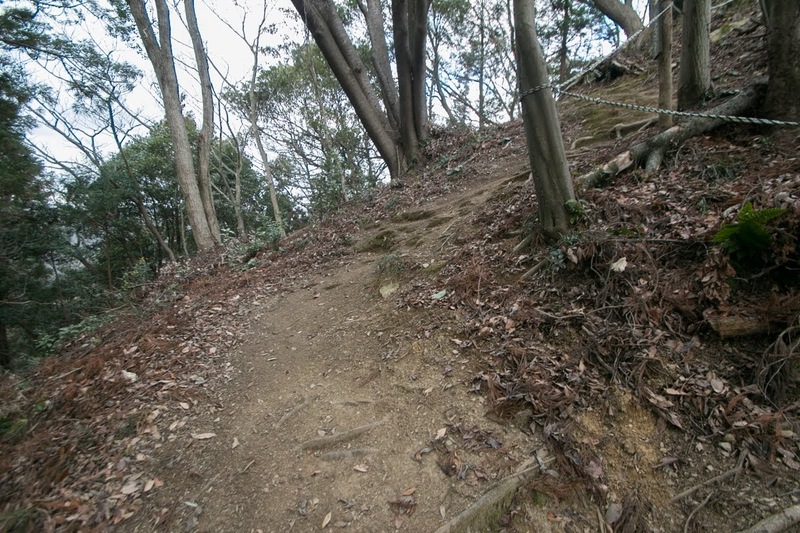 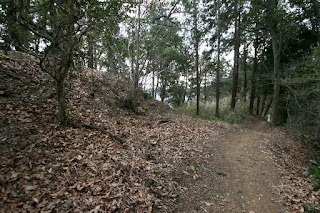 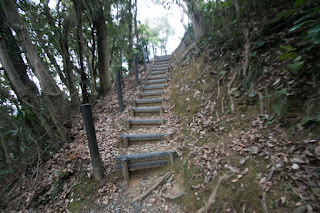 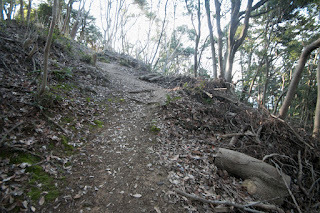 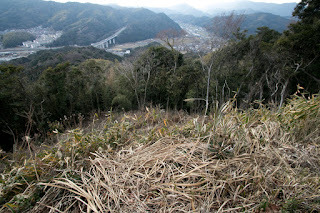 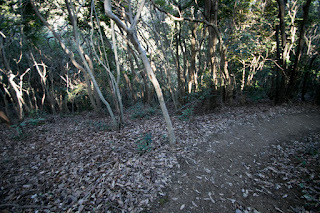 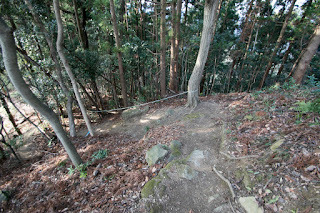 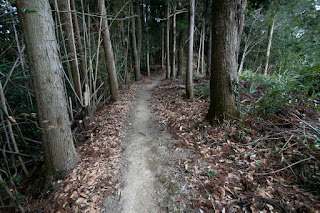 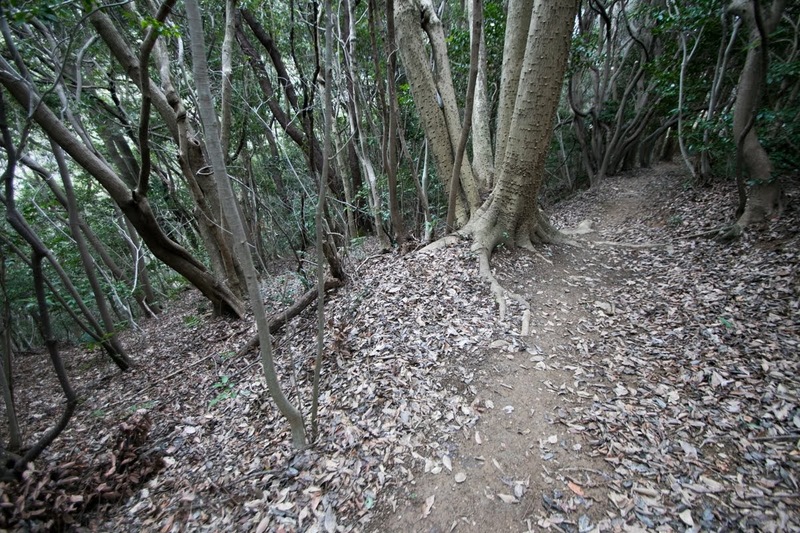 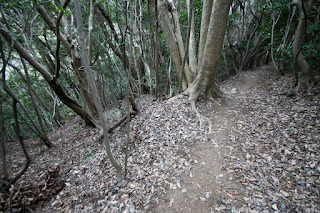 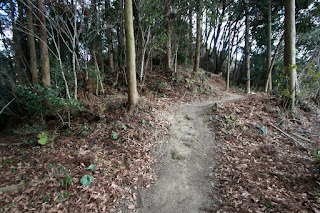 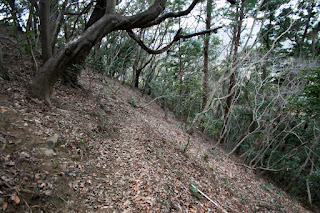 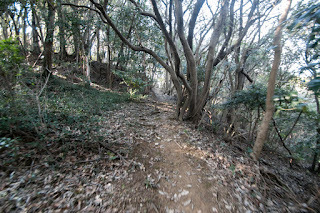 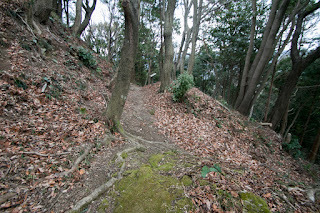 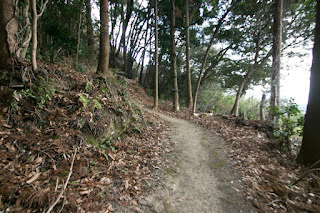 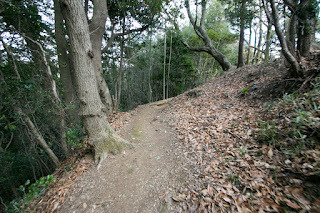 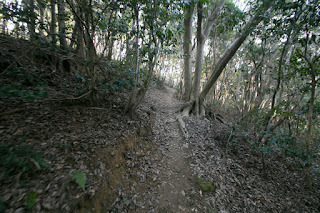 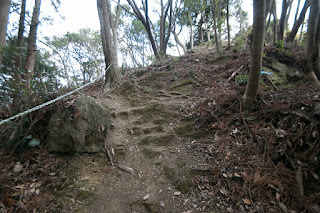 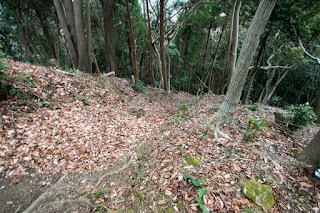 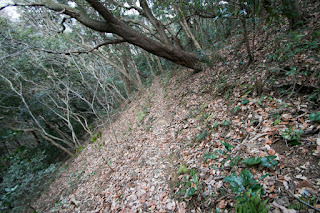 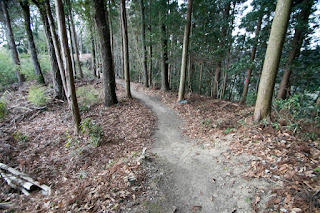 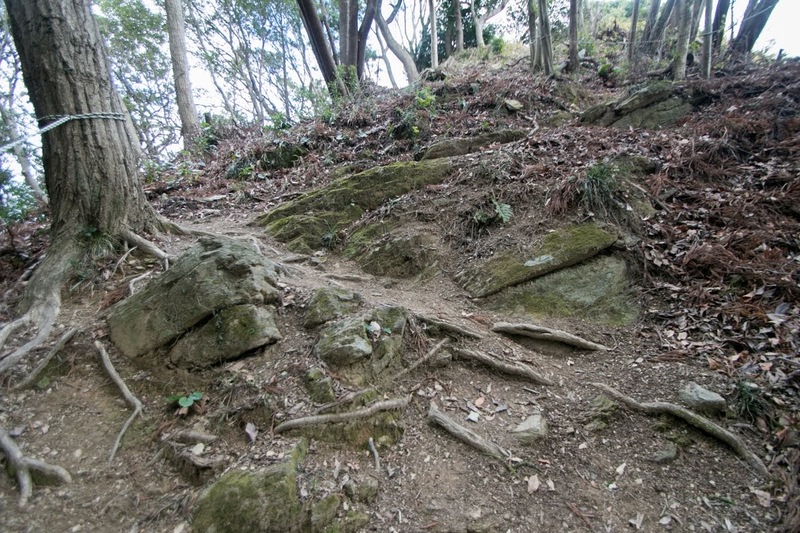 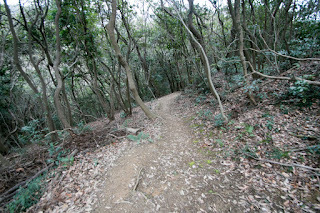 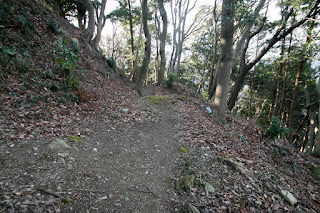 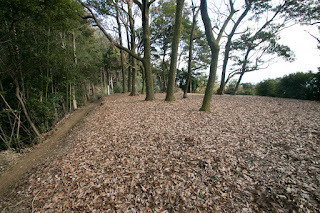 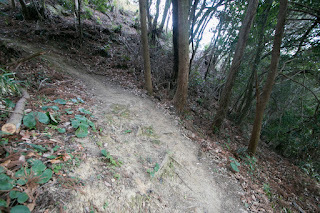 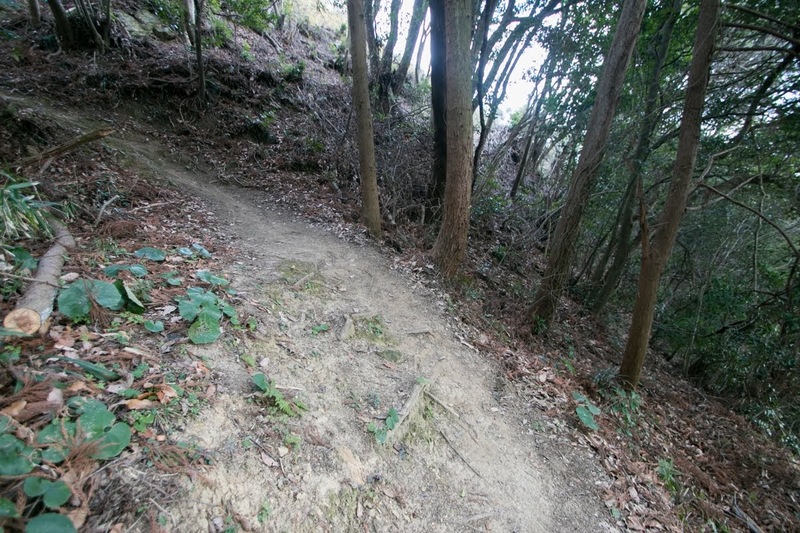 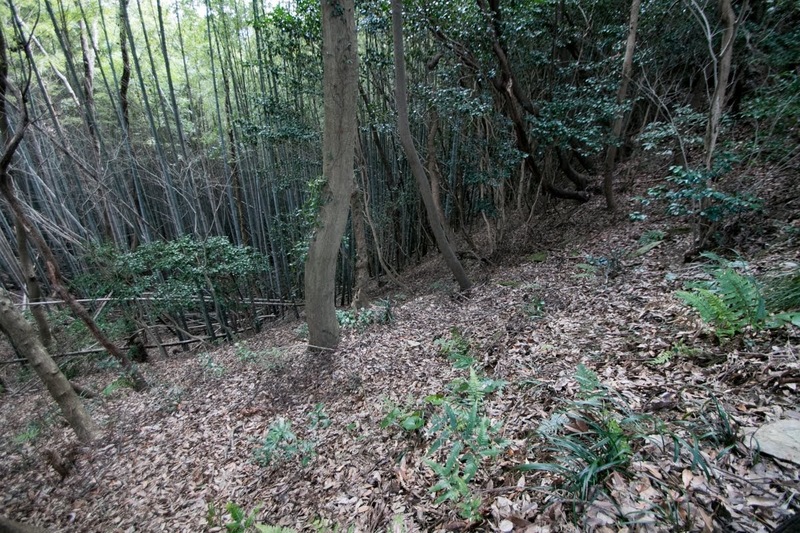 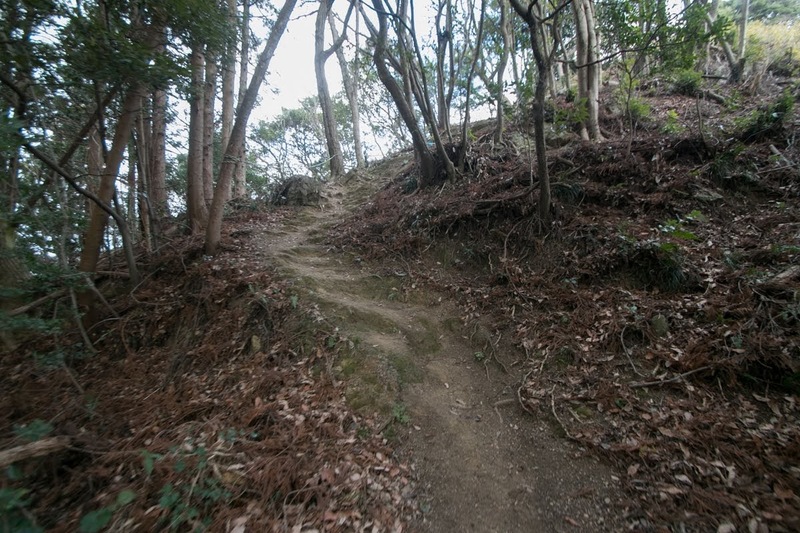 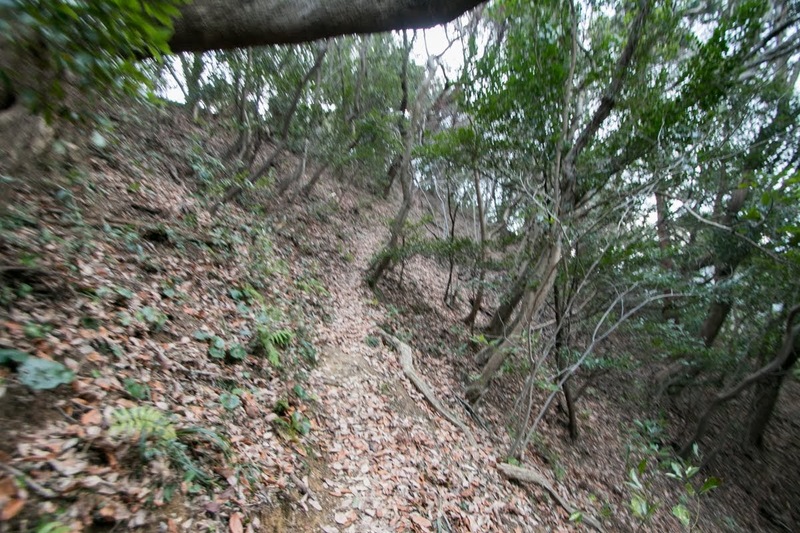 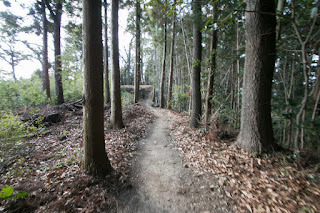 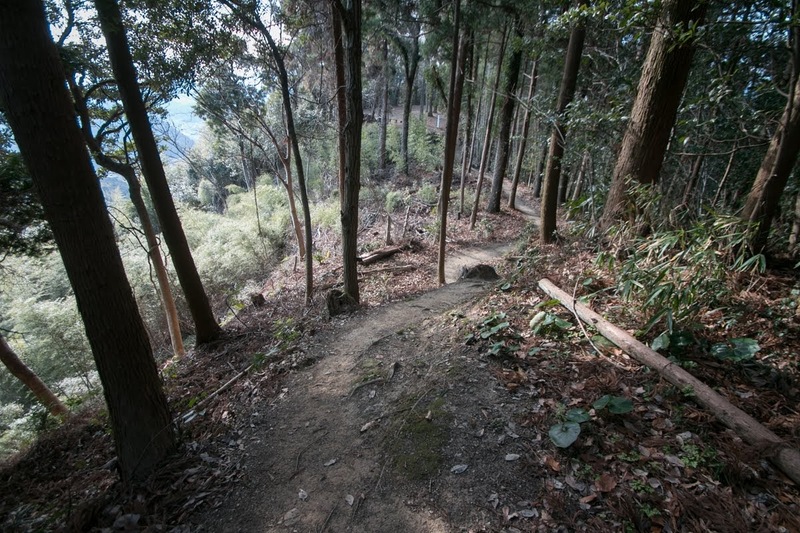 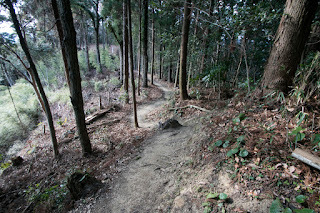 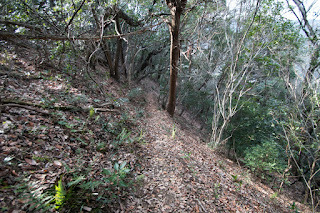 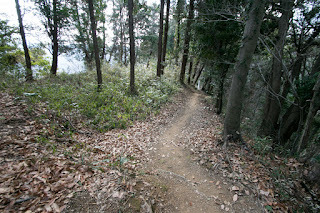 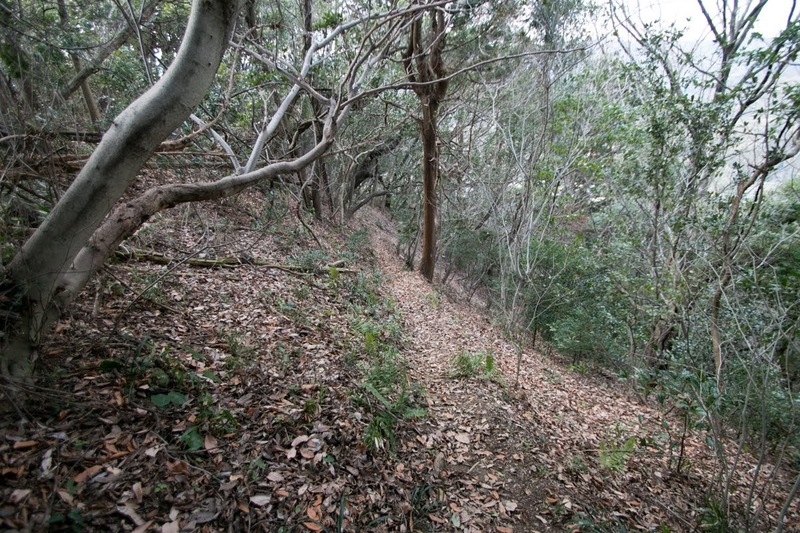 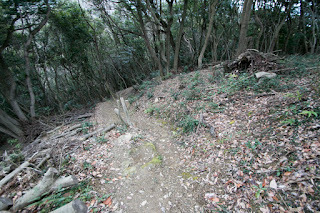 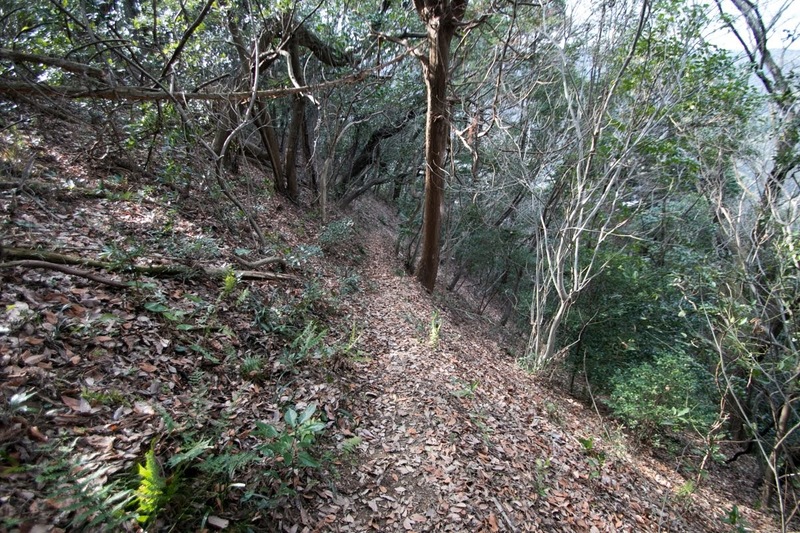 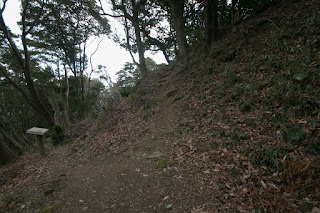 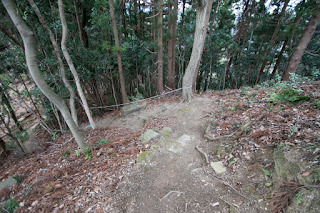 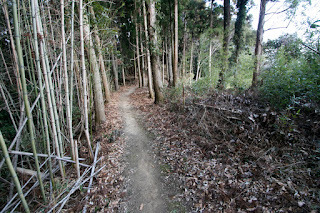 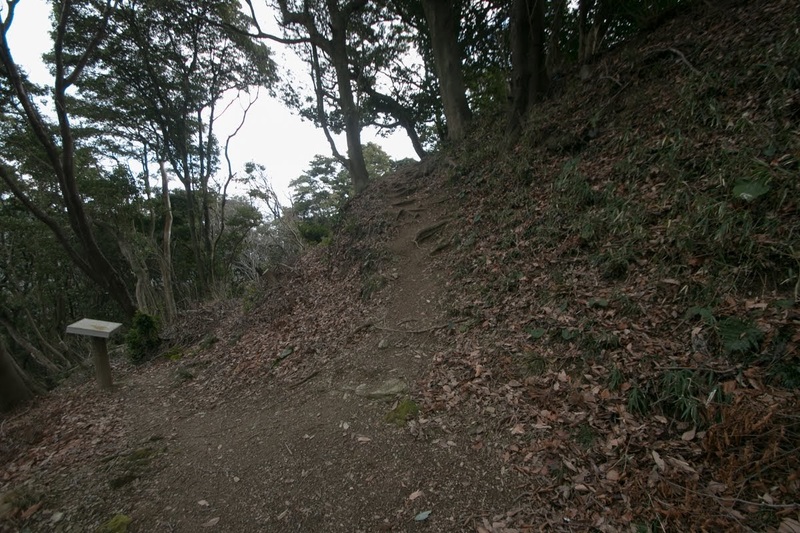 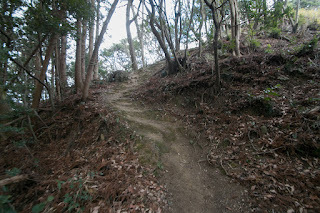 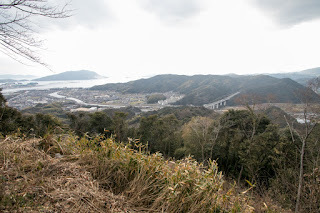 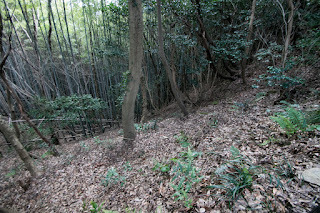 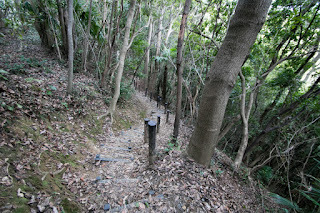 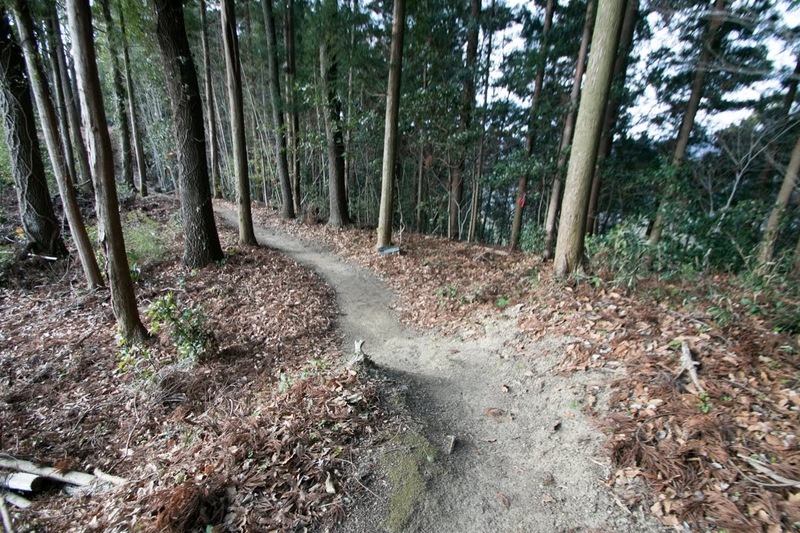 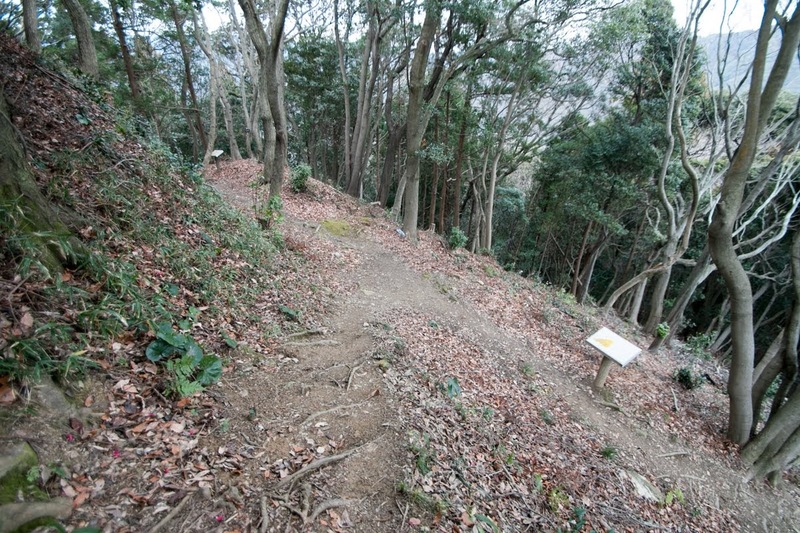 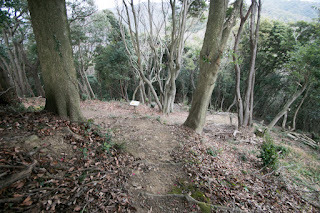 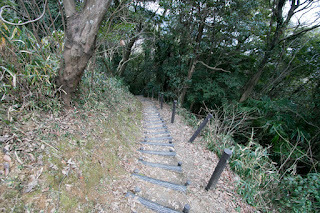 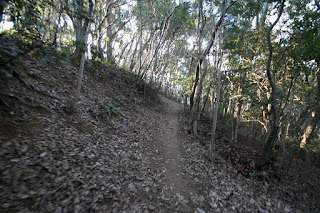 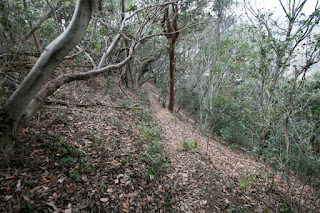 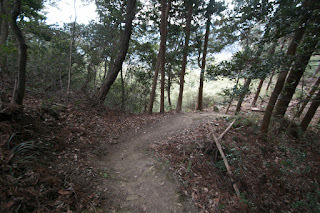 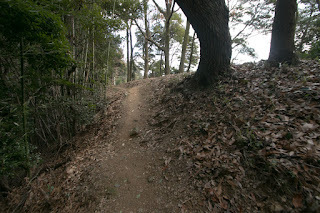 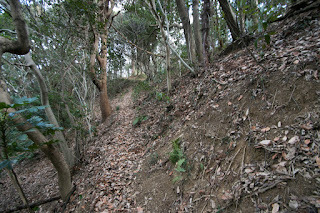 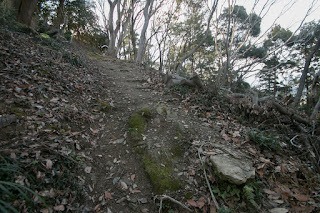 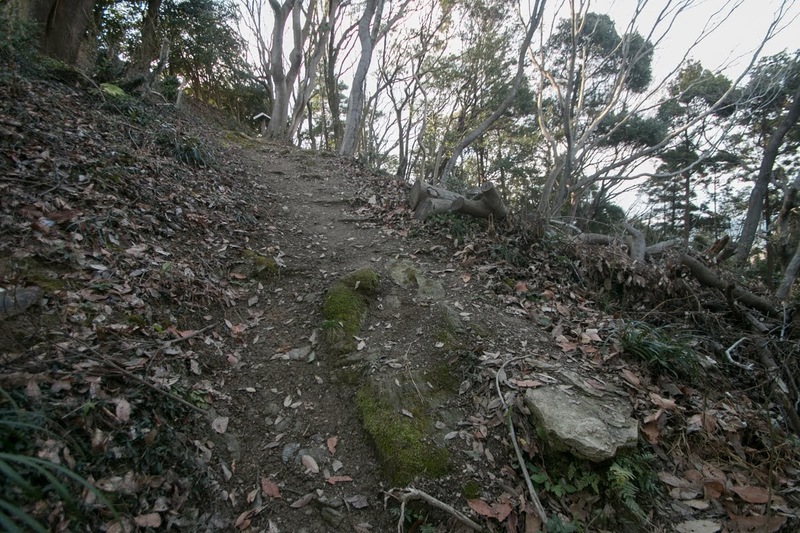 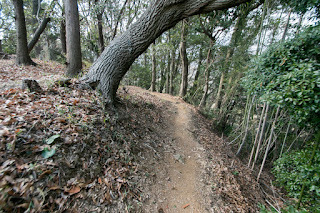 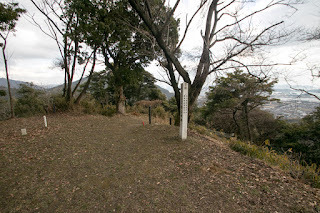 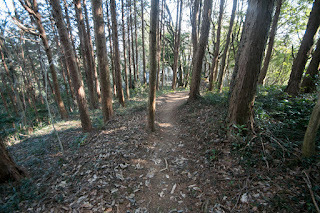 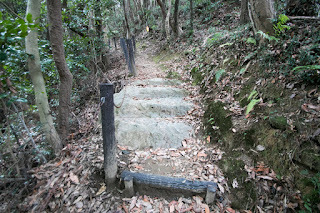 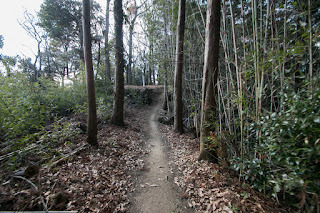 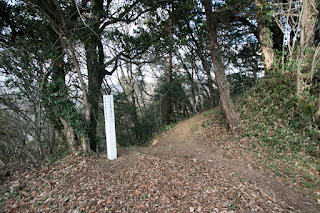 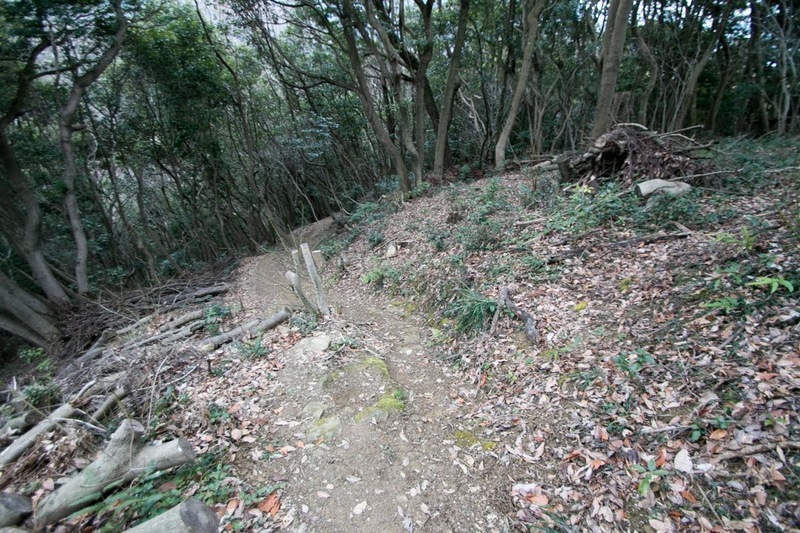 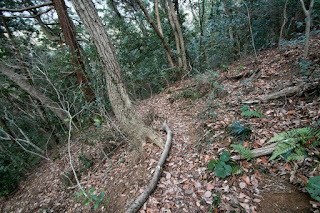 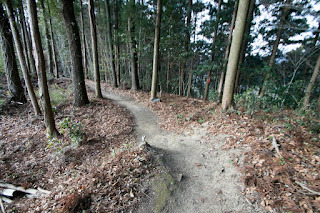 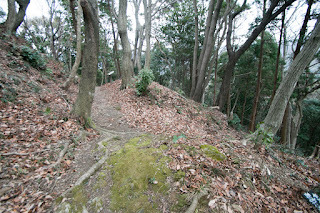 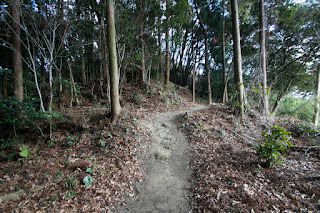 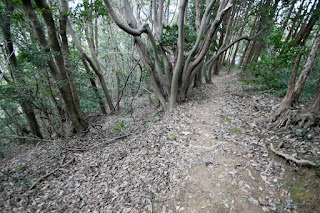 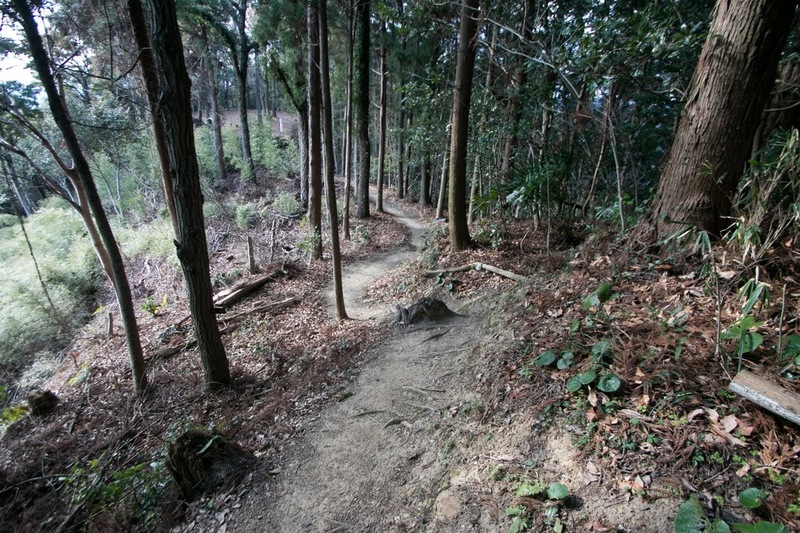 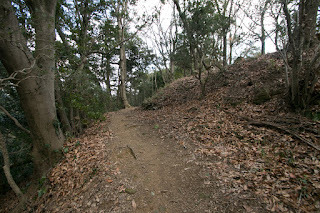 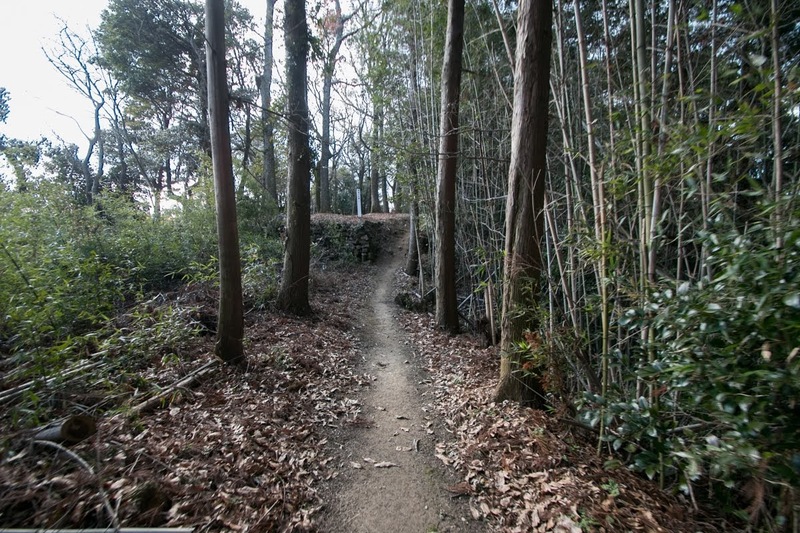 Suo Wakayama castle spreads a narrow long ridge of Wakayama mountain continues over 400 meter. 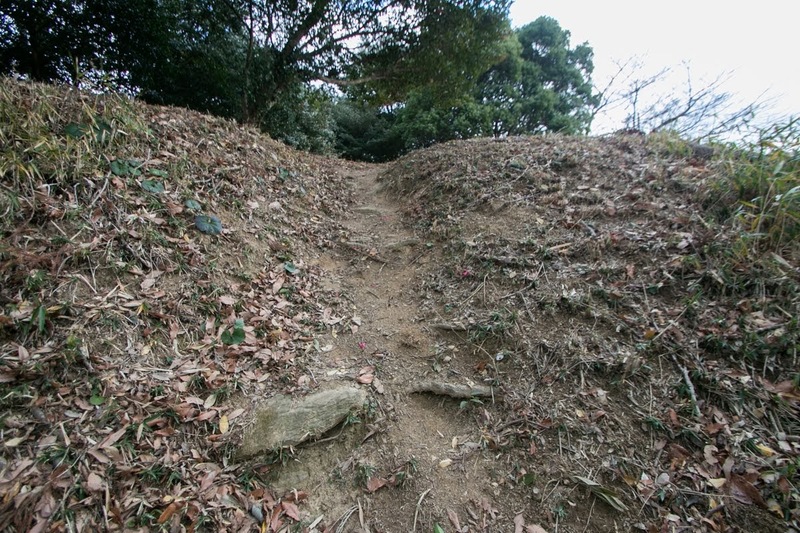 Structure of the castle is quite simple and long and narrow terrace such as third area, secondary area, central area, Nishinomaru area and Kurayashiki area continues from east to west in line. 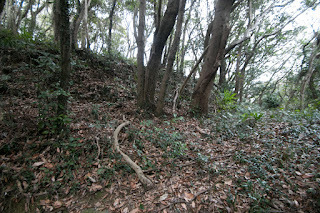 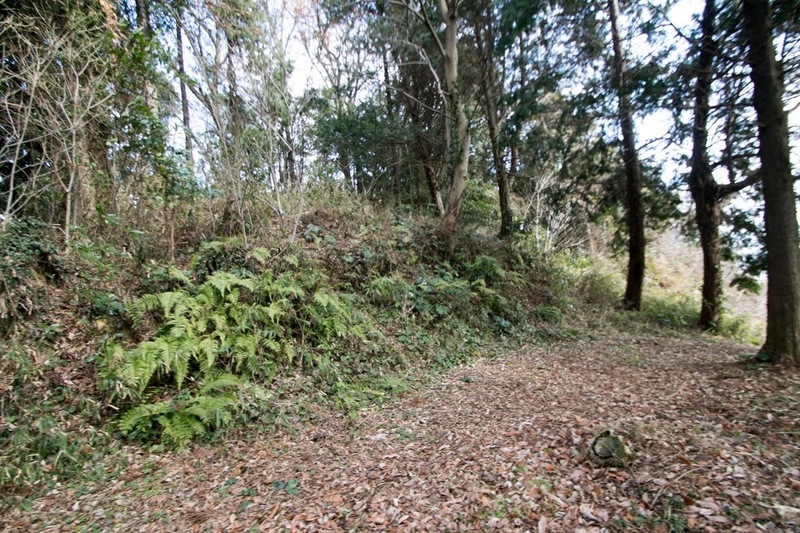 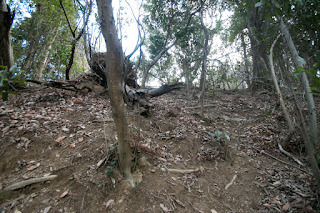 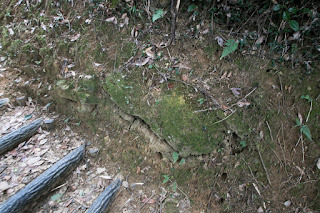 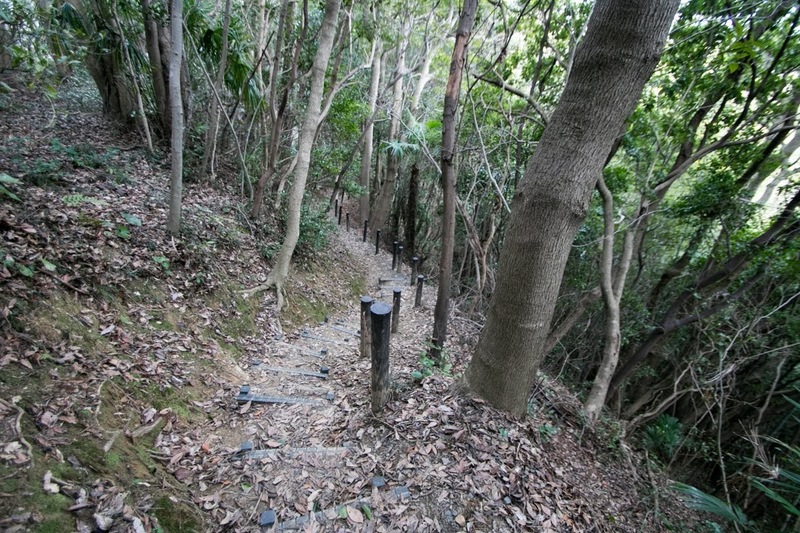 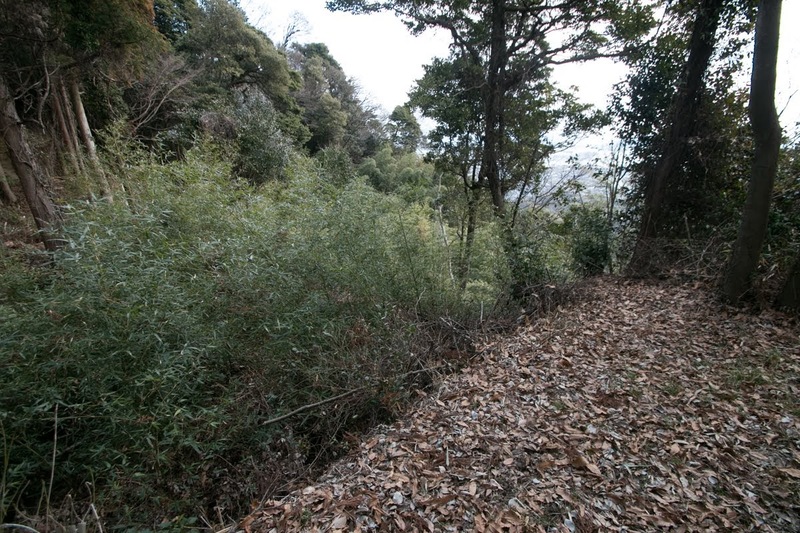 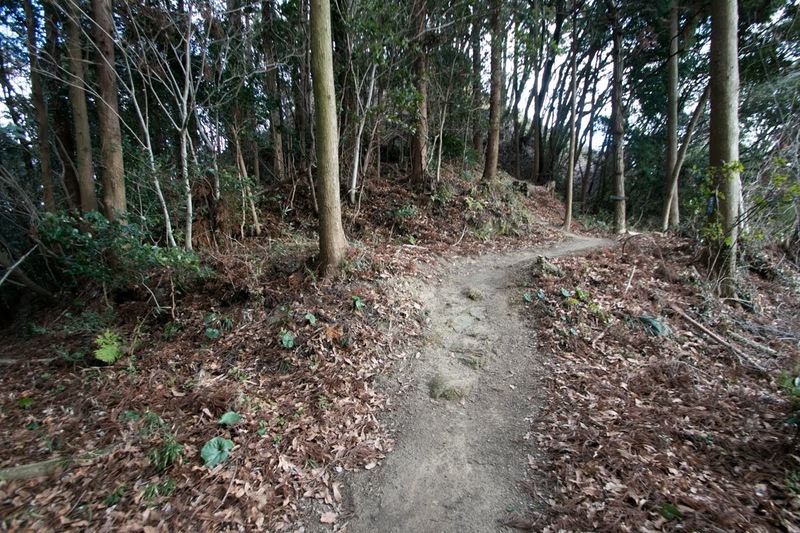 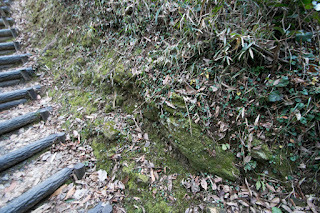 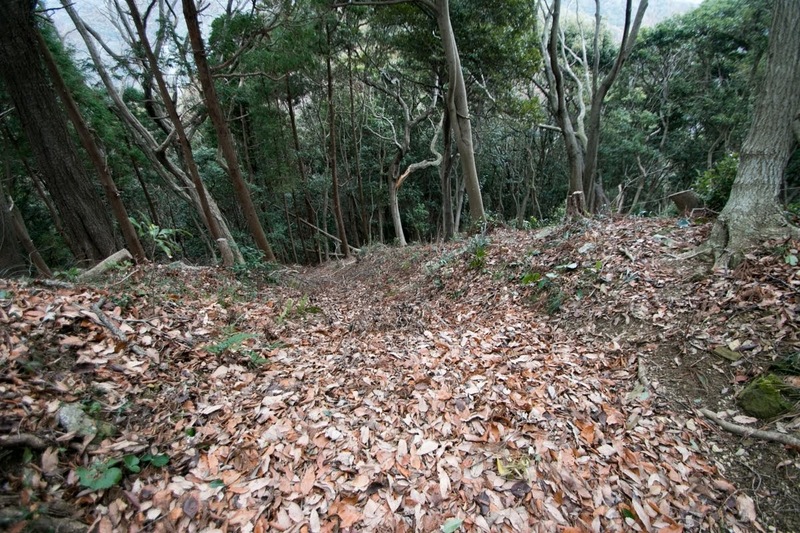 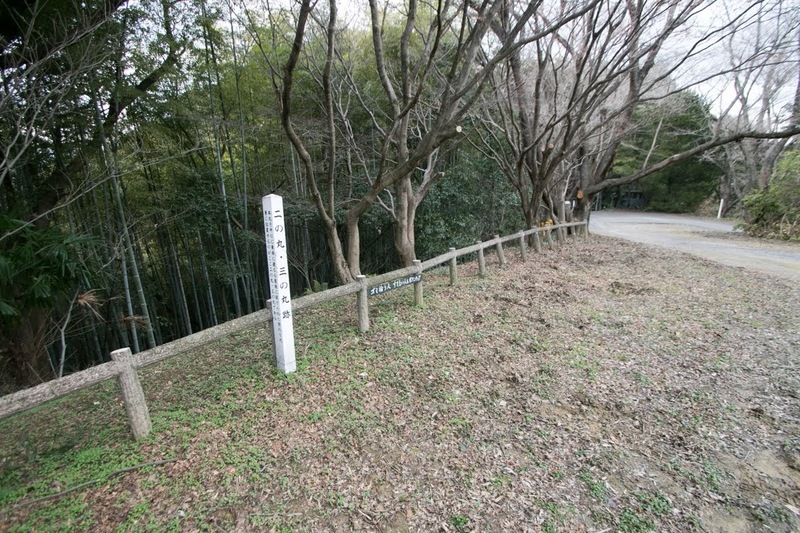 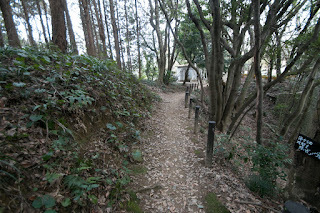 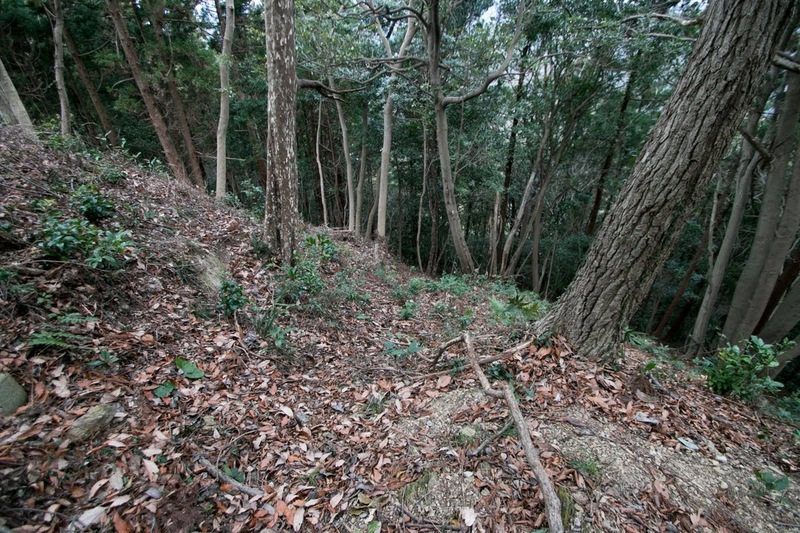 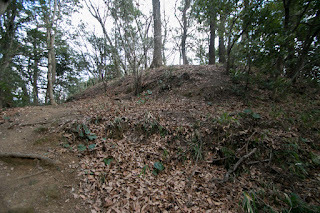 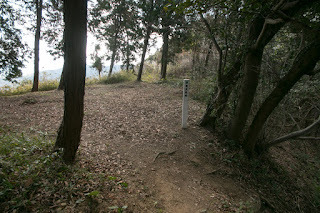 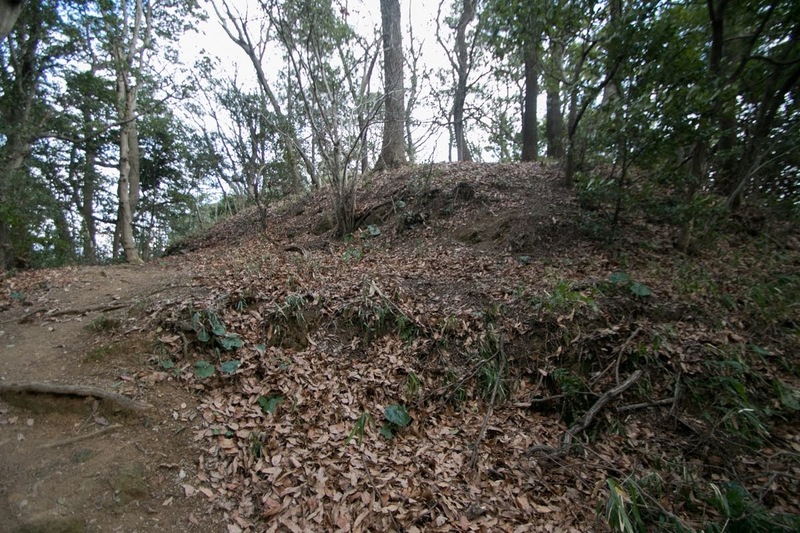 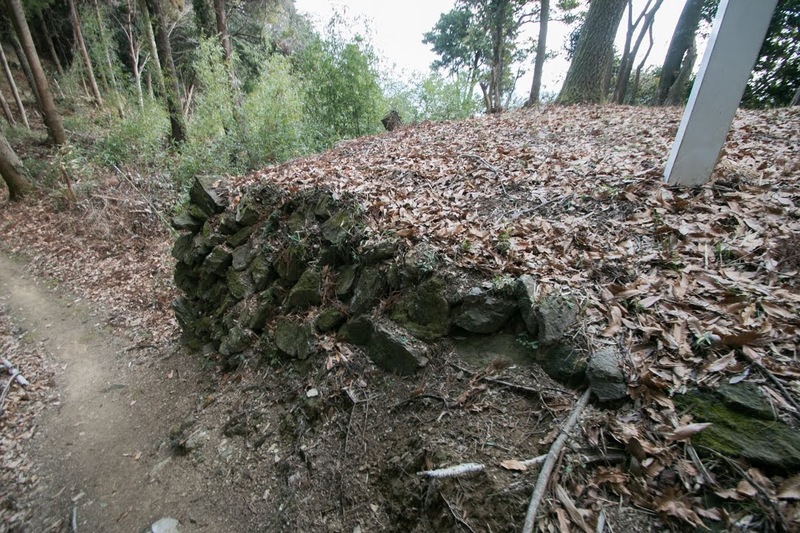 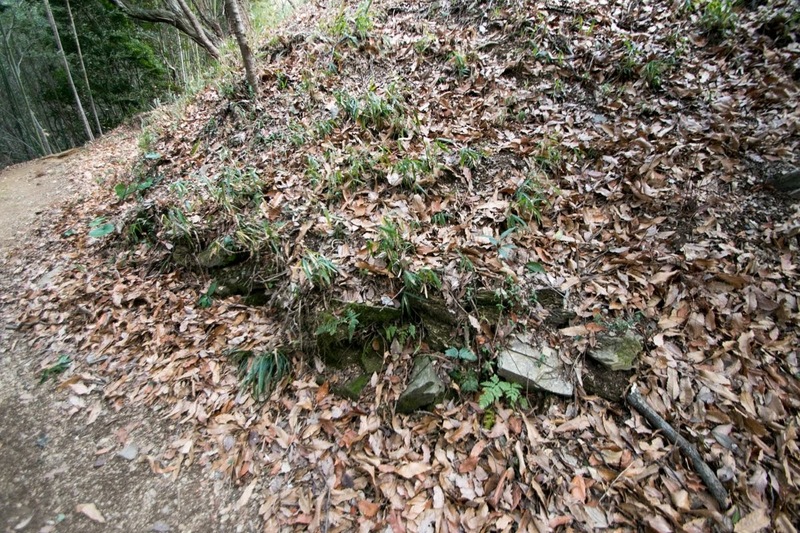 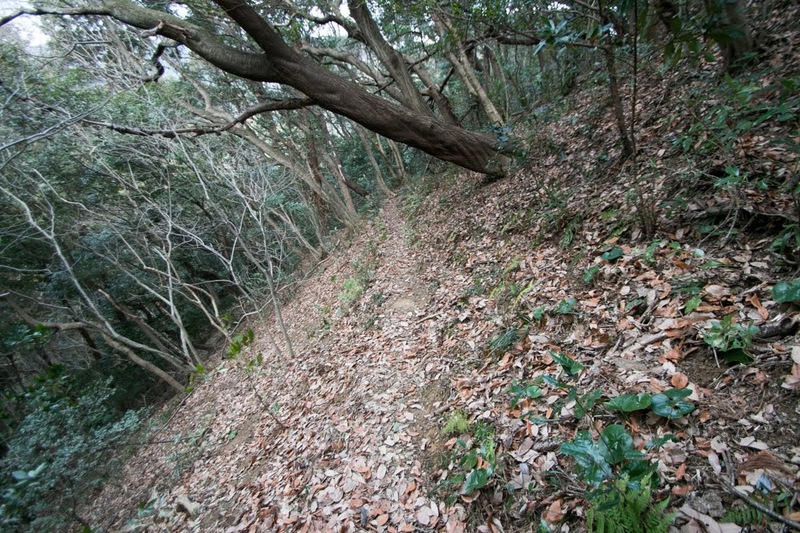 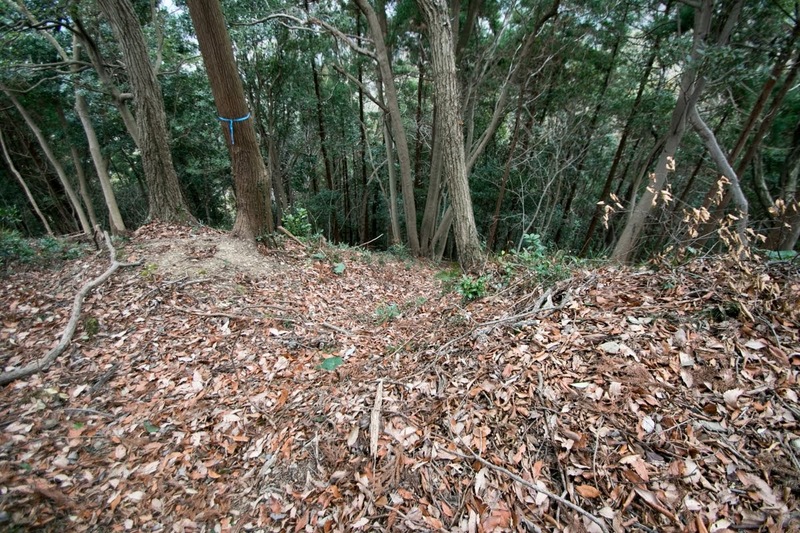 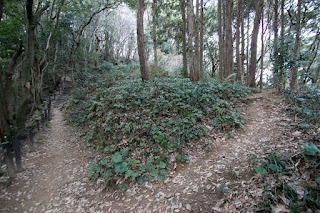 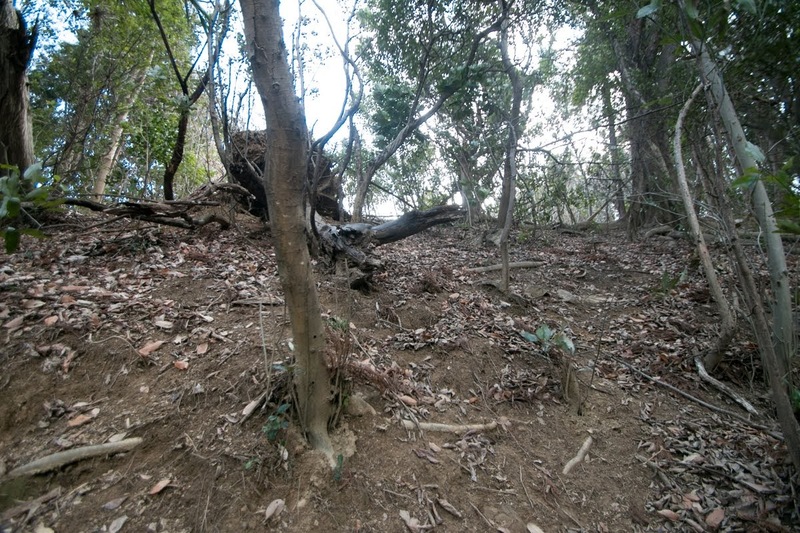 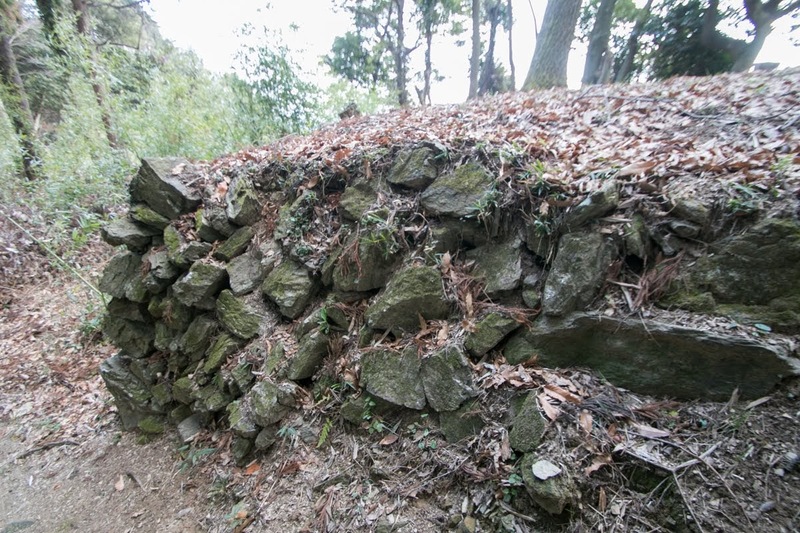 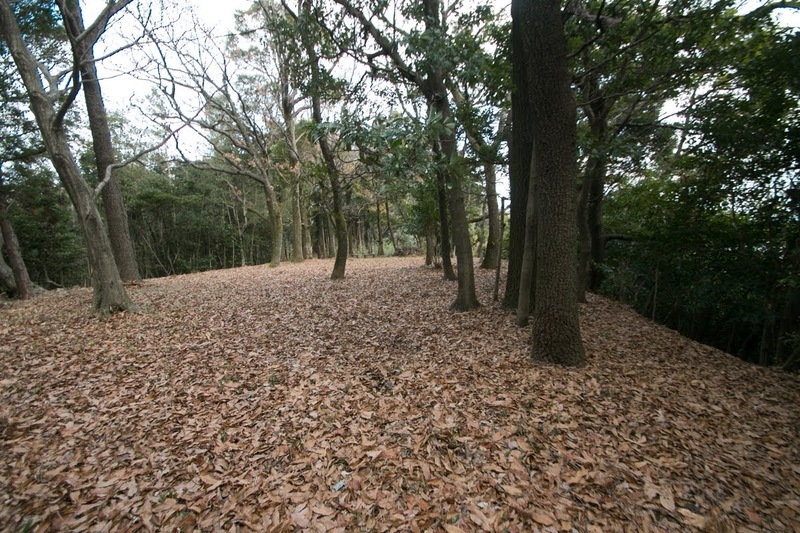 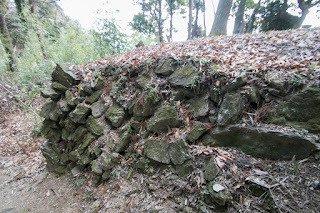 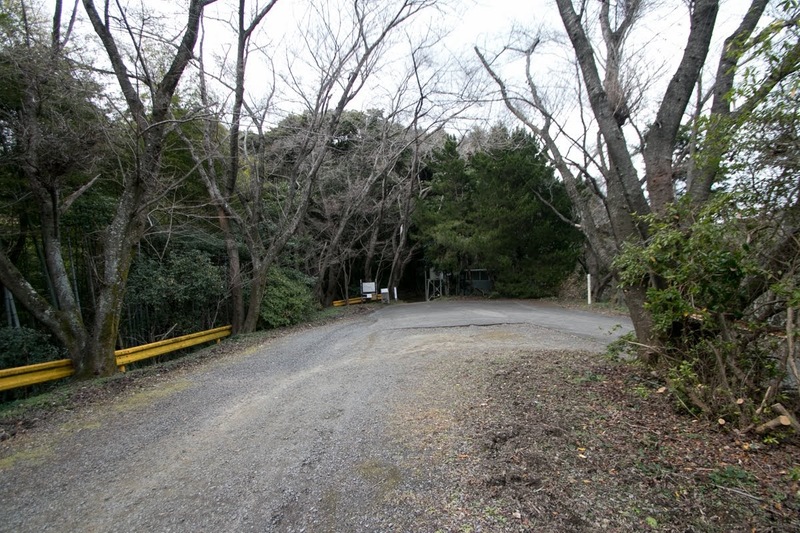 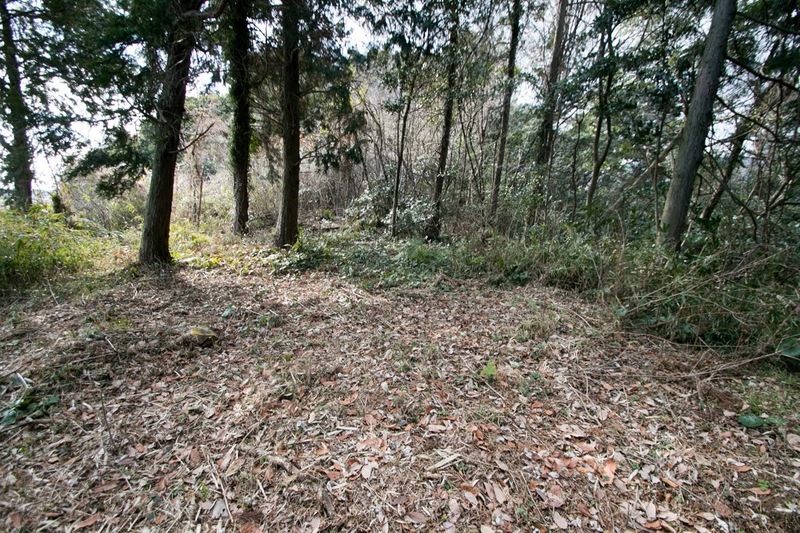 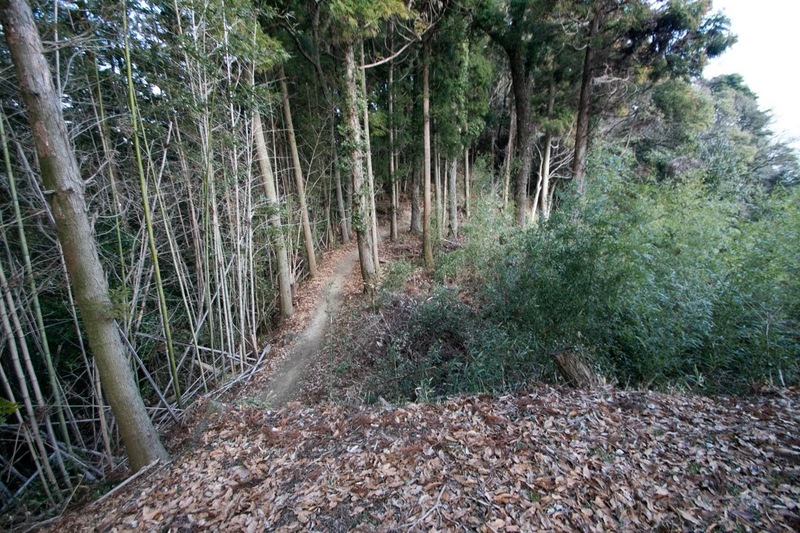 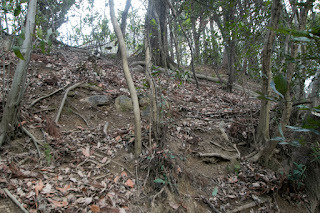 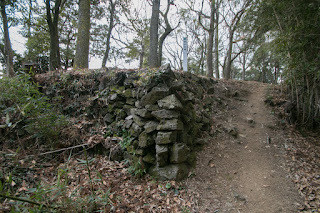 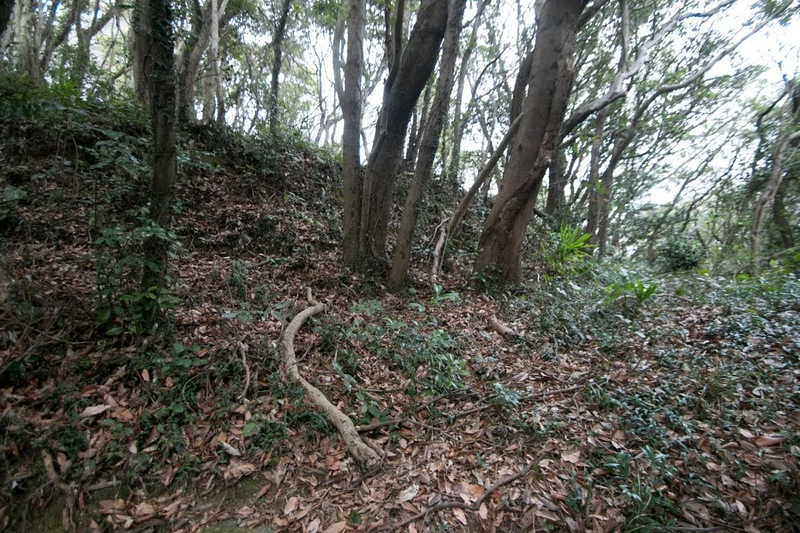 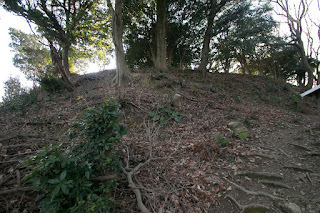 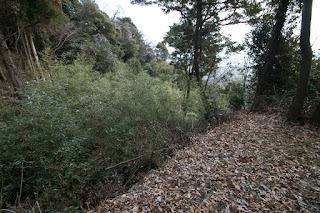 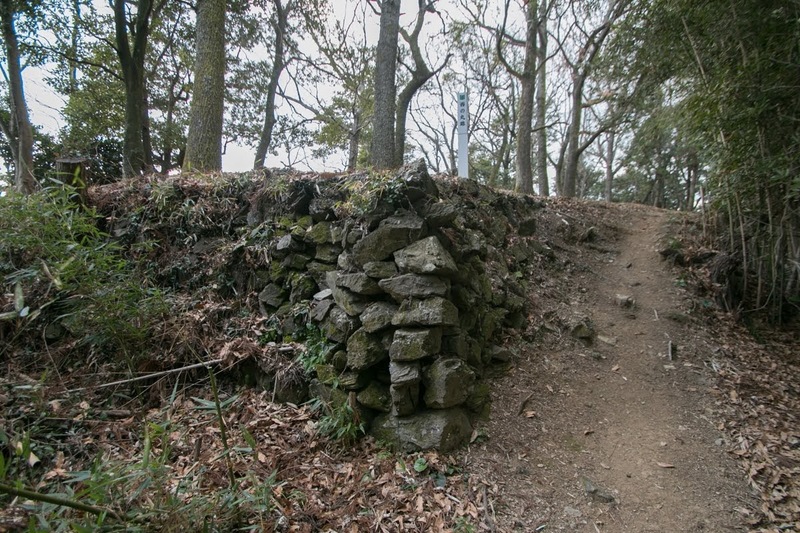 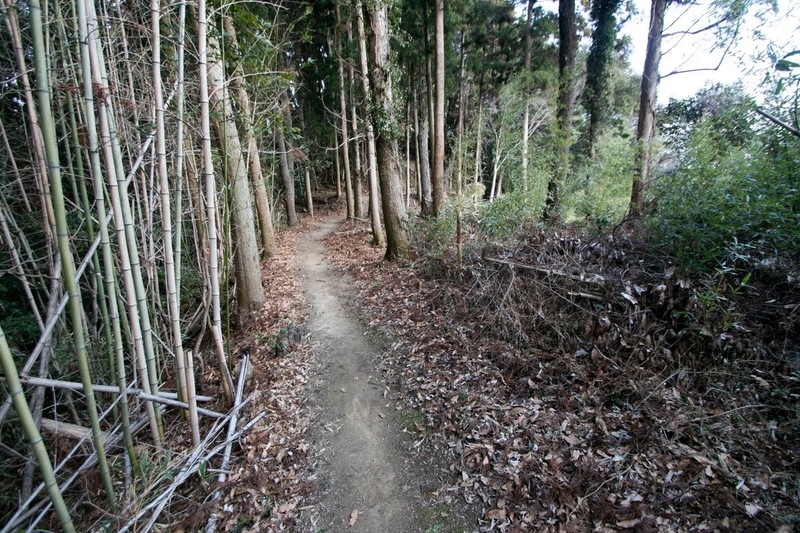 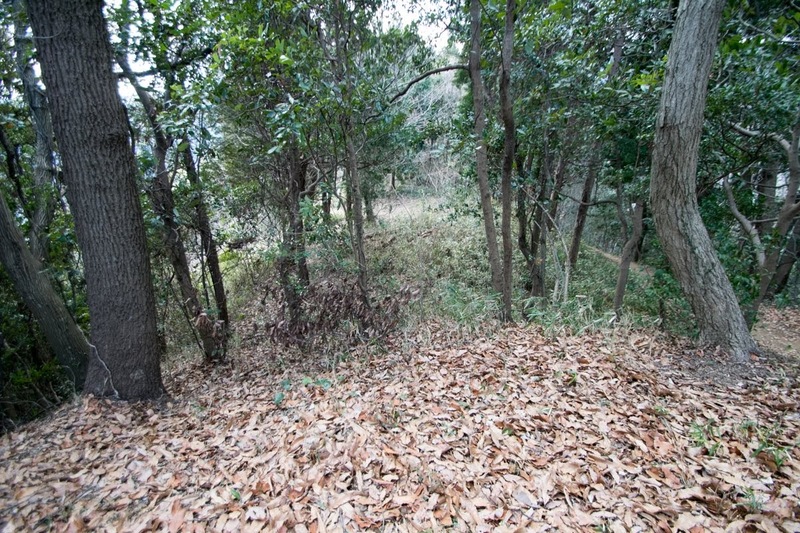 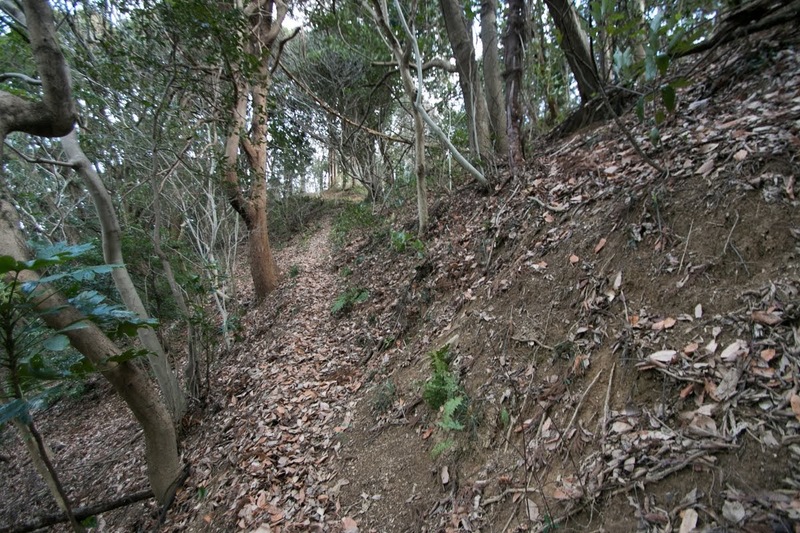 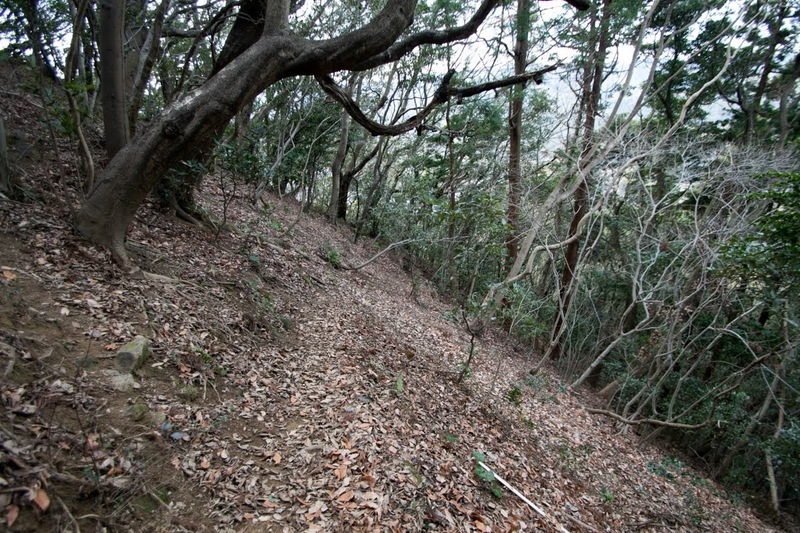 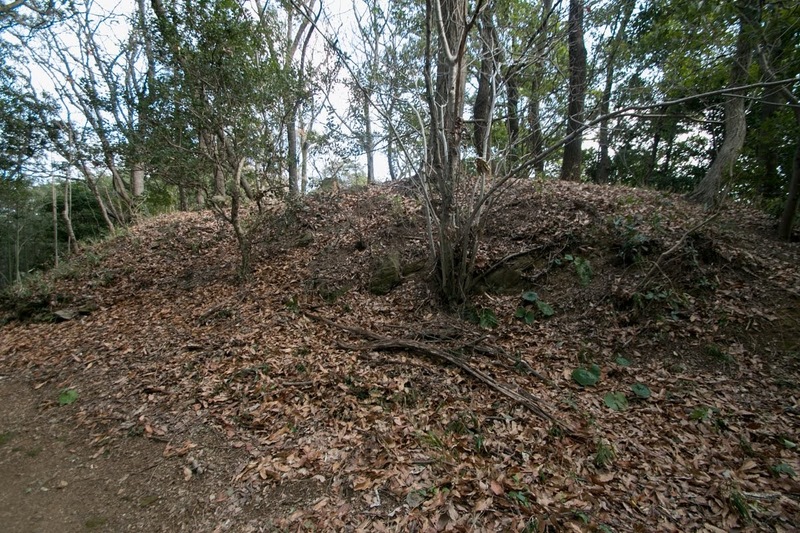 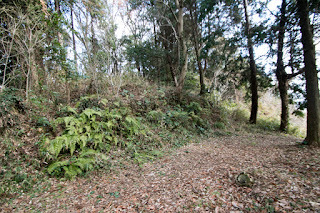 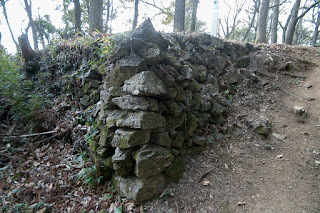 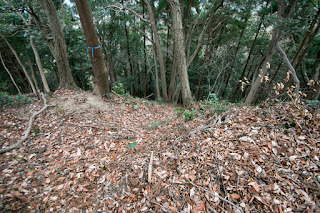 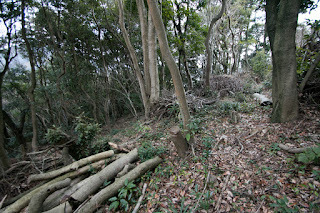 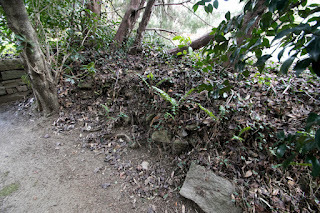 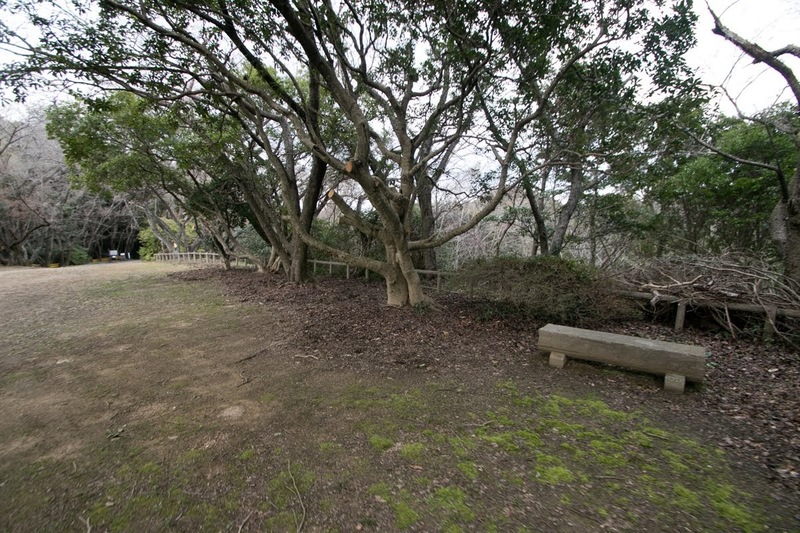 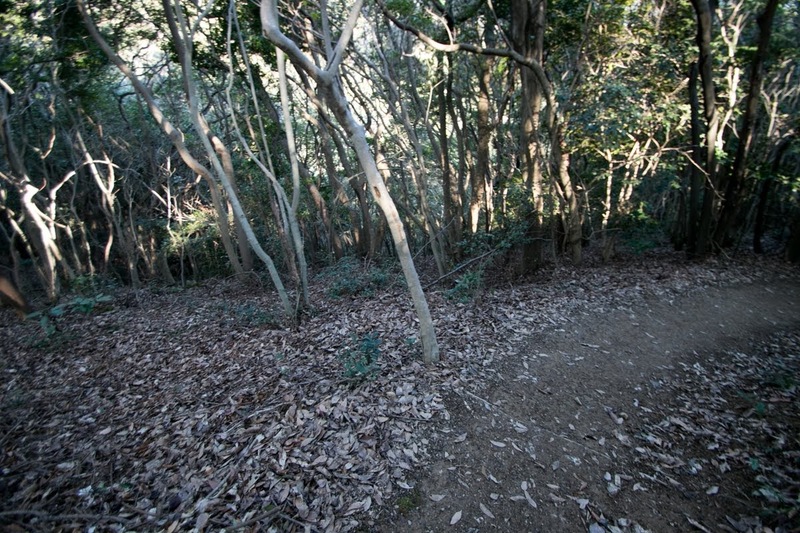 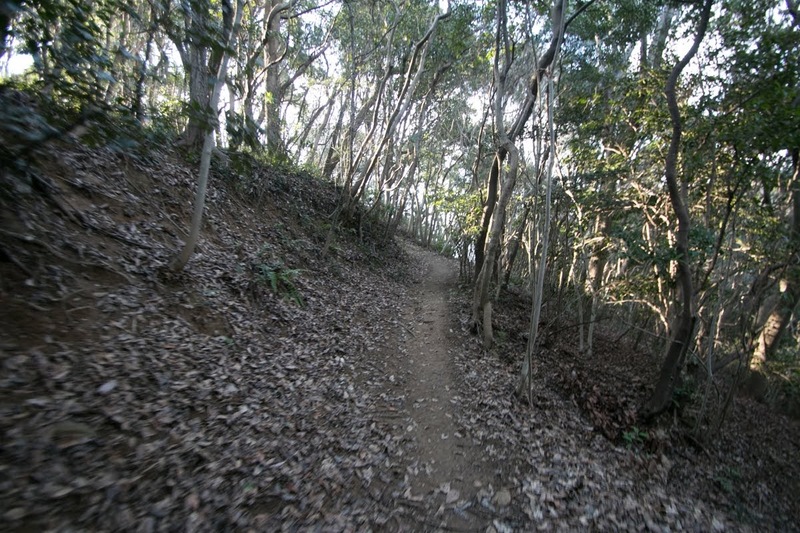 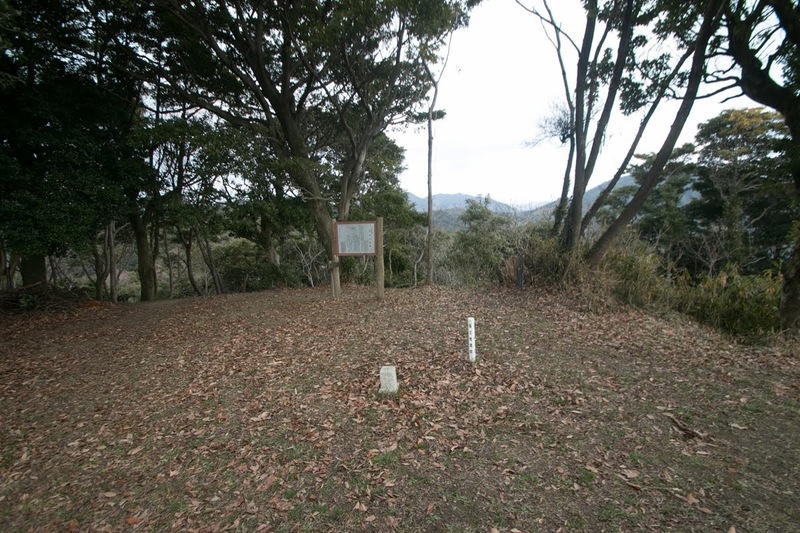 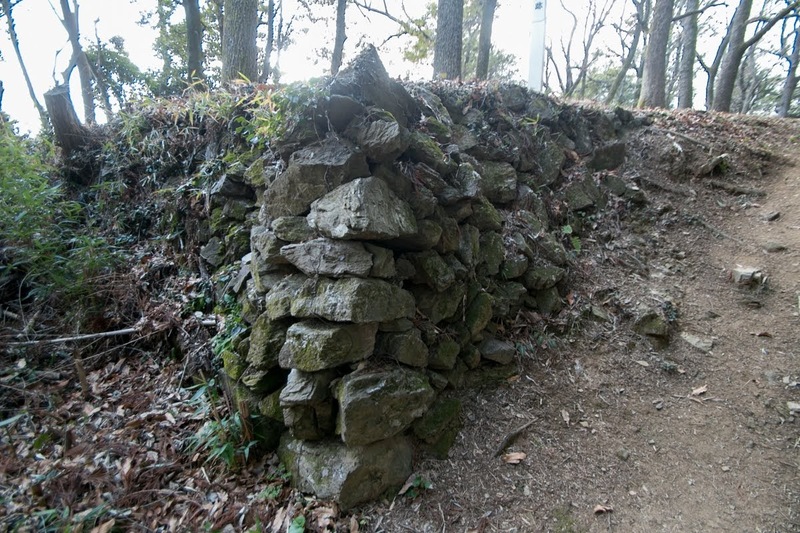 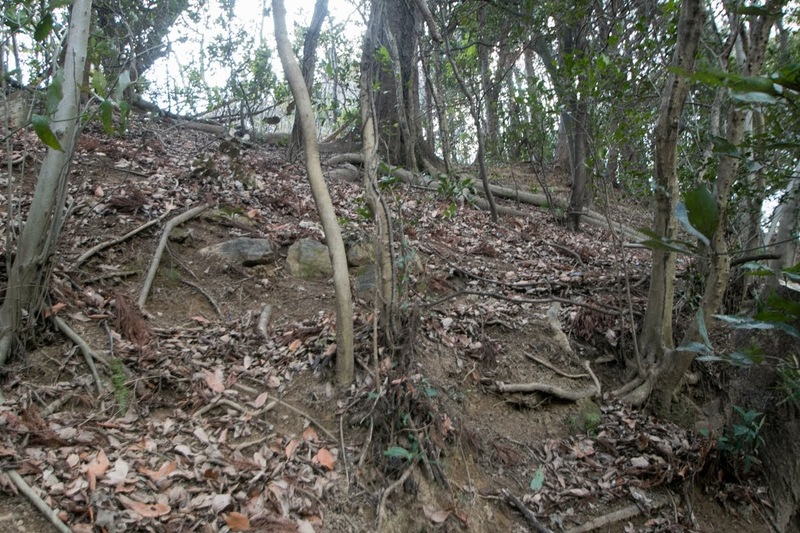 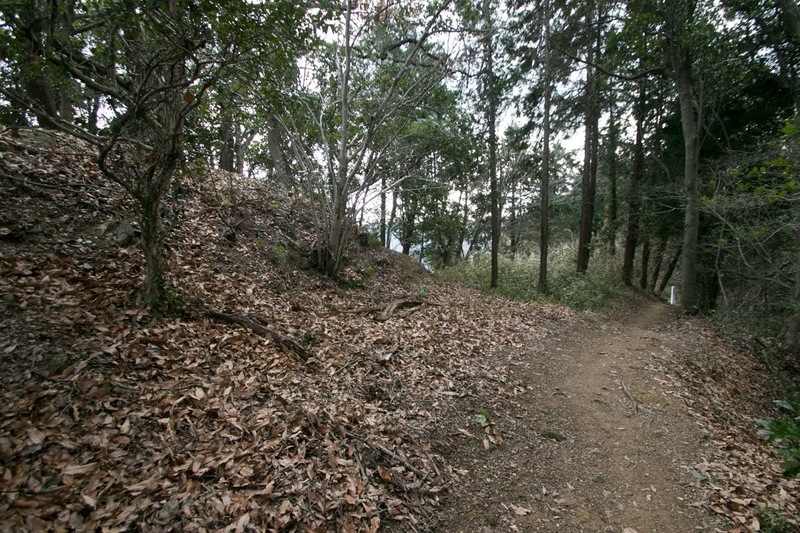 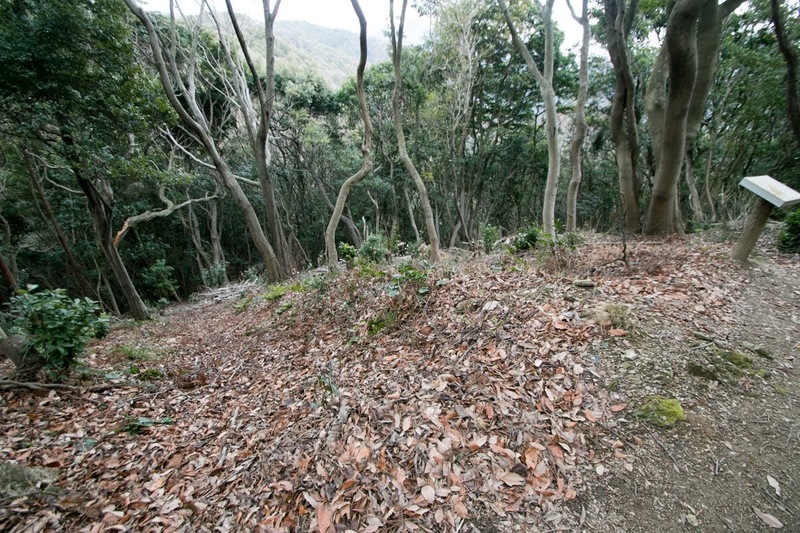 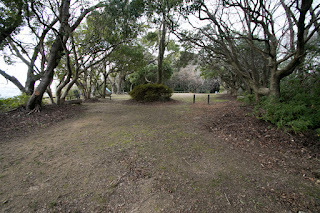 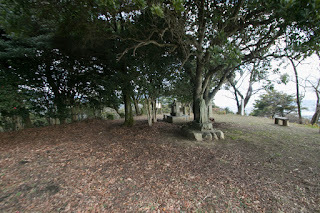 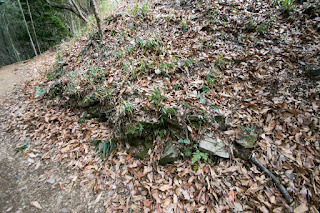 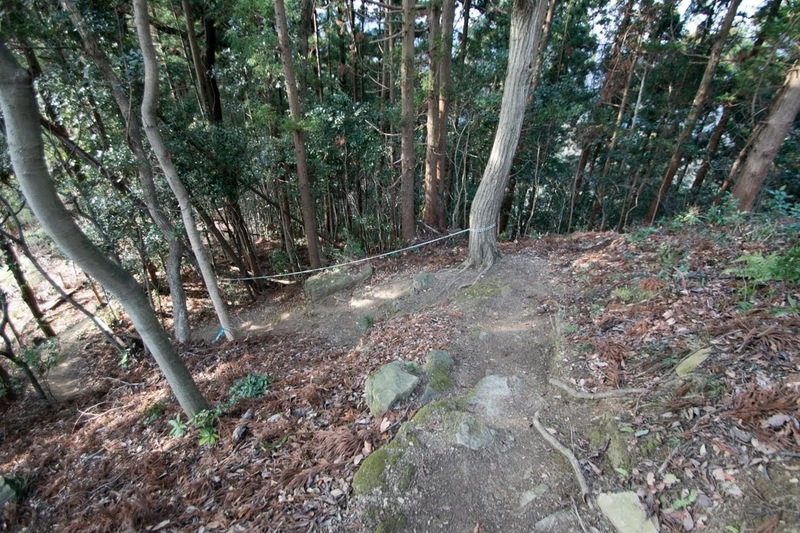 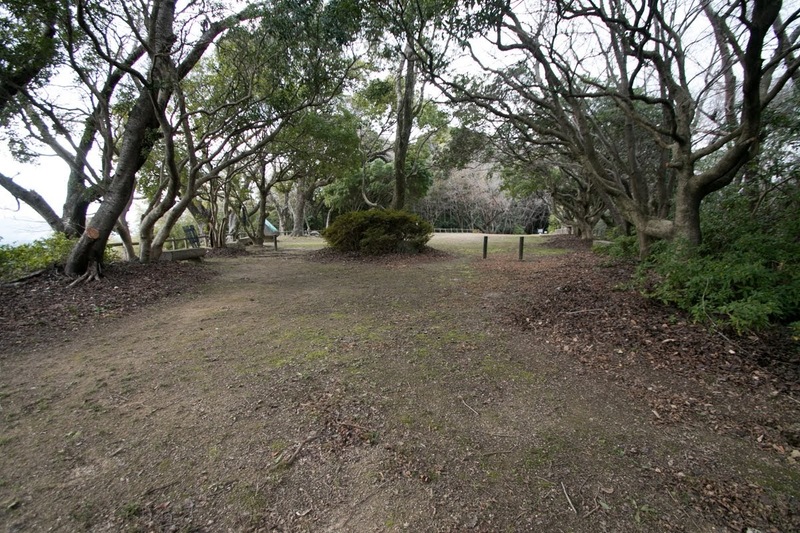 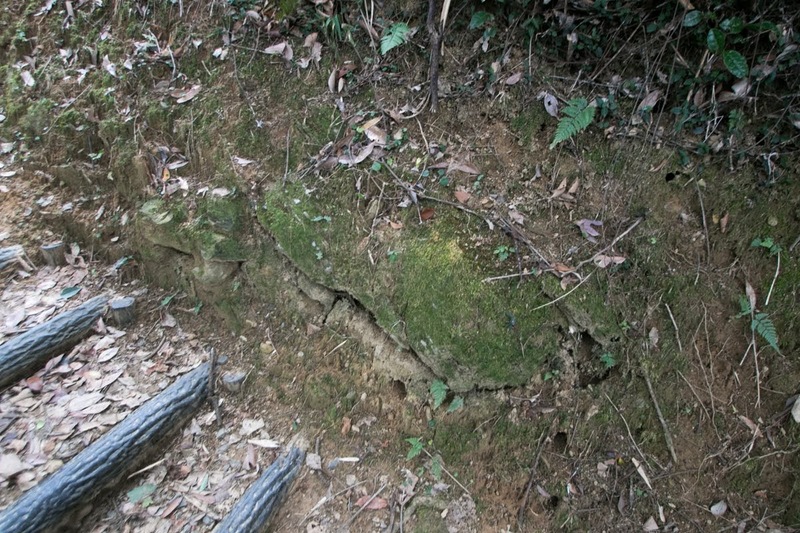 There remain only limited number of defense structures, but low stone wall exists at the eastern line of Nishinomaru area. Considering small and low size, this might be the decoration at entrance at the residence of the lord, rather than defense facility. 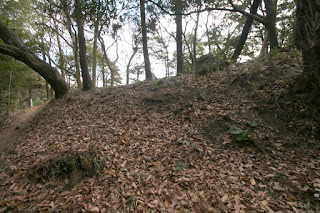 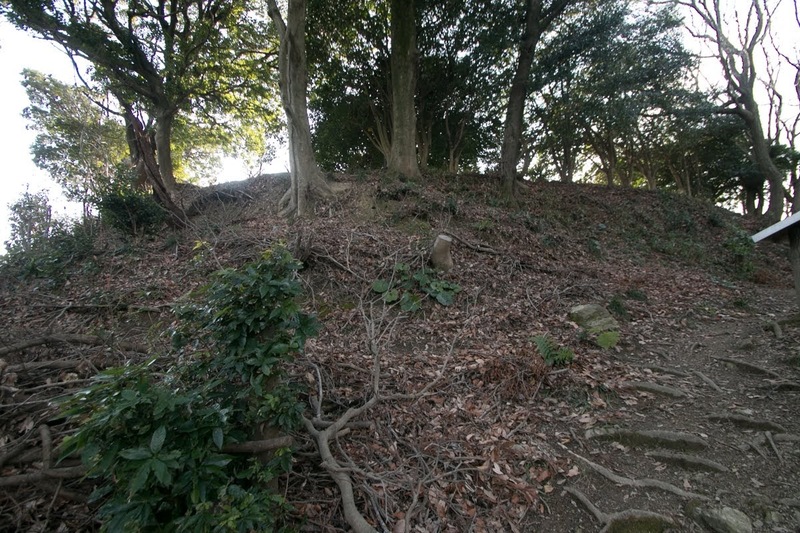 Castle area is protected by sheer cliff but north slope of central area is a bit gentle, thus to avoid direct attack from this side combination of vertical dry moats are built here. 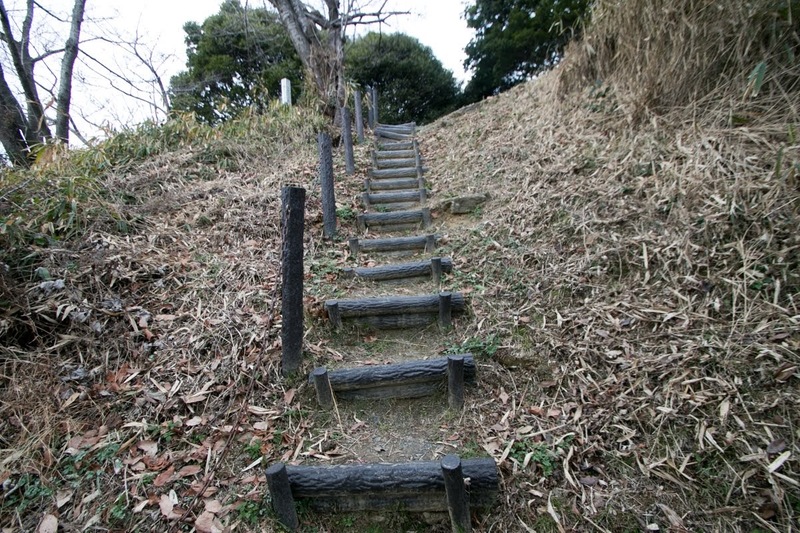 In 1551, Taketo Sagara made a false accusation that Harukata Sue attempted rebellion against Yoshitaka. 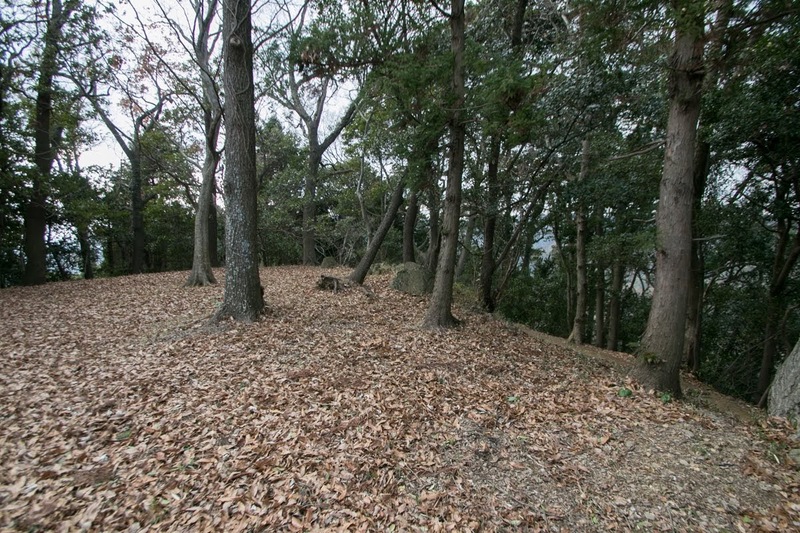 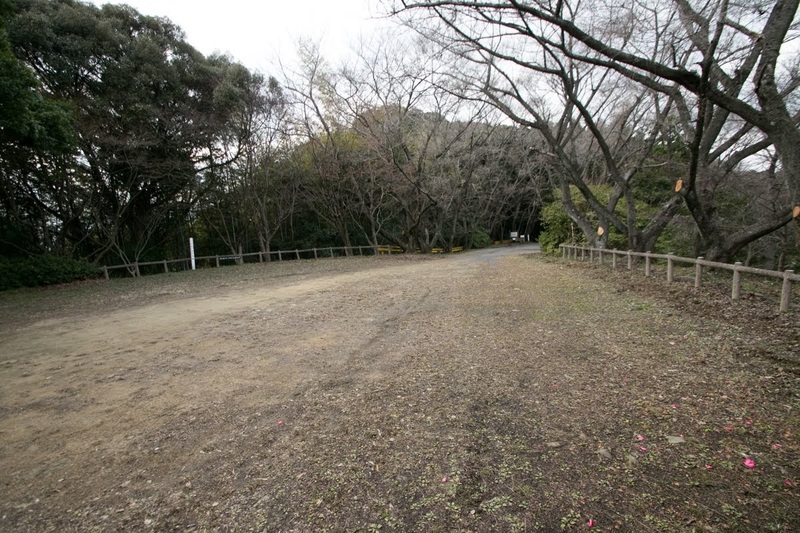 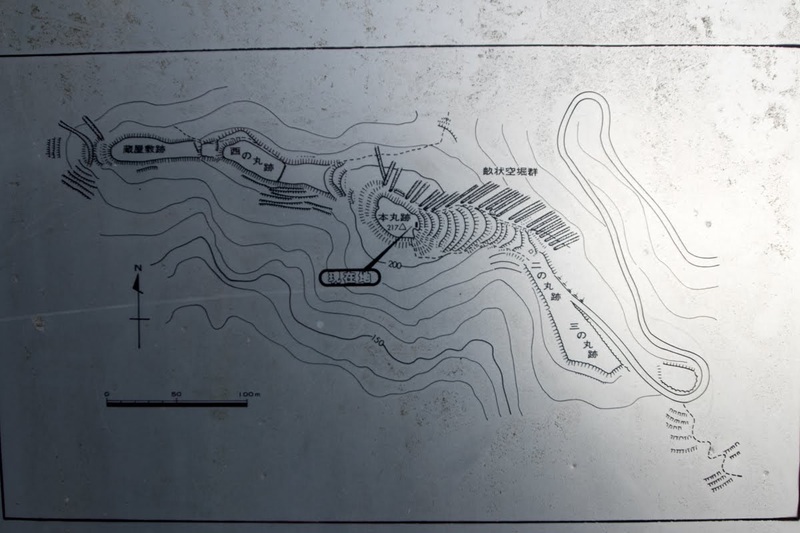 Looking at this, Harukata who made preparatory negotiations with Motonari Mouri or Ouchi clan raised his army in August, and assaulted Yoshitaka Ouchi at Yamaguchi city. 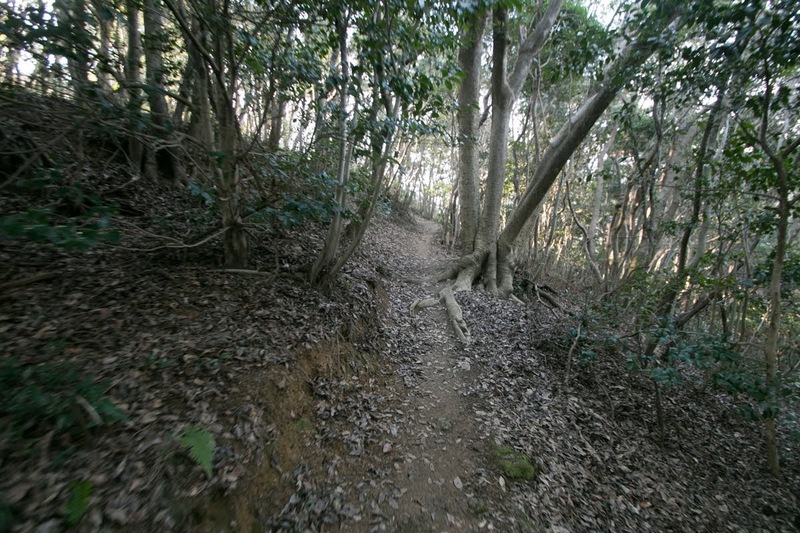 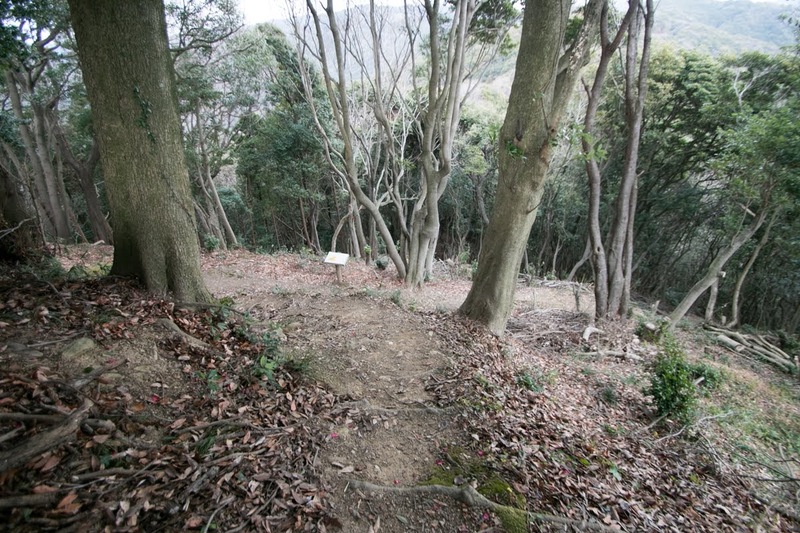 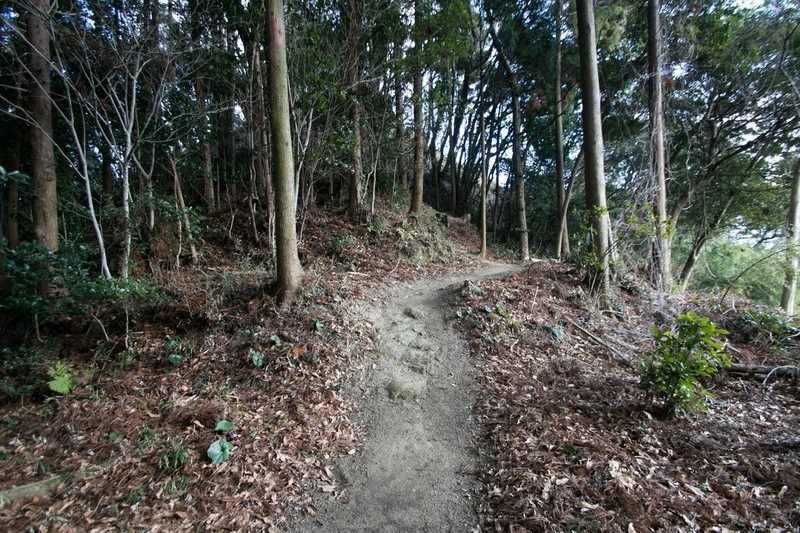 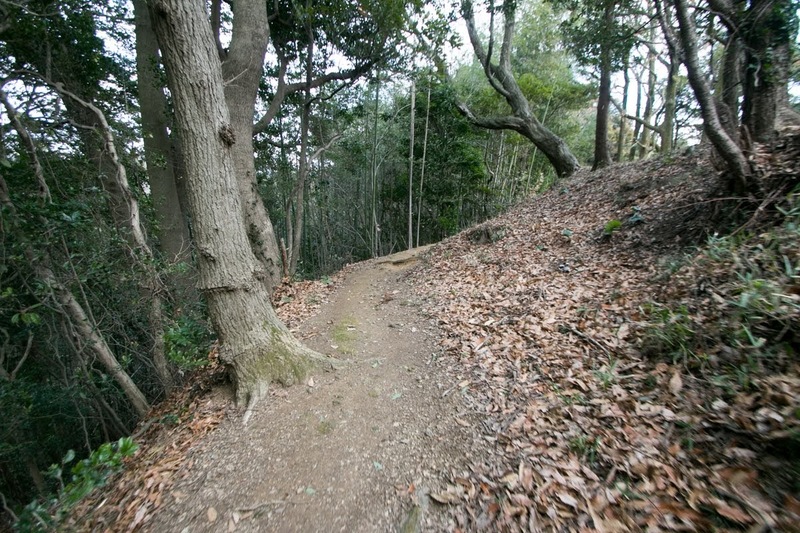 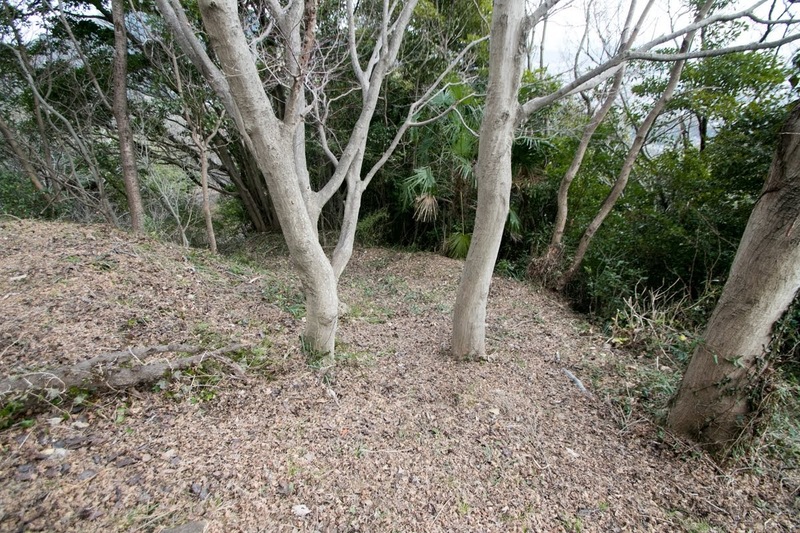 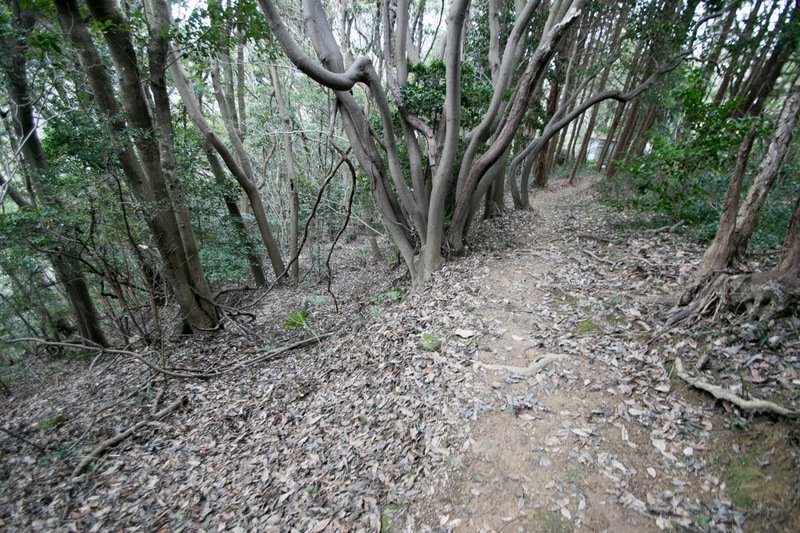 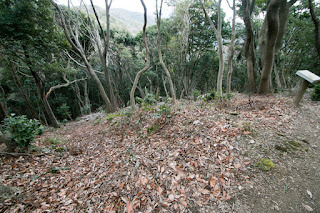 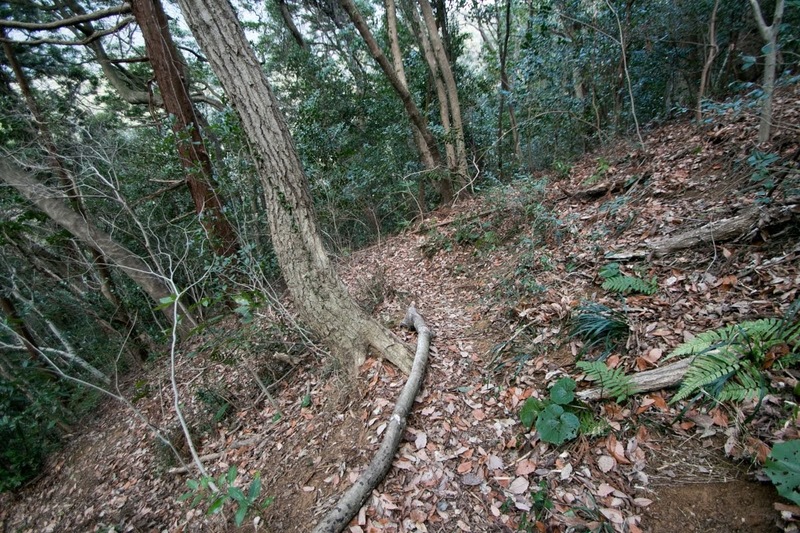 Many retainers of Ouchi clan gave up Yoshitaka, then Yoshitaka who could not secure his residence tried to escape to Yoshimi clan at Iwami province by ship. But this ship could not voyage because of storm, thus Yoshitaka killed himself at Daineiji temple at current Nagato city. 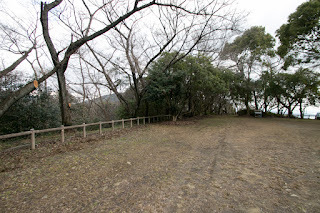 This coup d'etat is called as incident of Daineiji, often compared with the incident of Honnoji in 1582, in which central ruler Nobunaga Oda (1534-1582) died in the assault of his general Mitsuhide Akechi (1528-1582) for its efficient process. 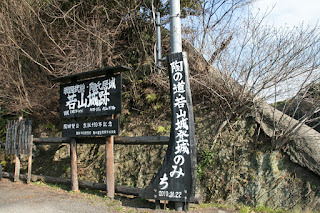 Yoshitaka who virtually grasped Ouchi clan placed relative of Ouchi clan at nominal leader and started his governance. 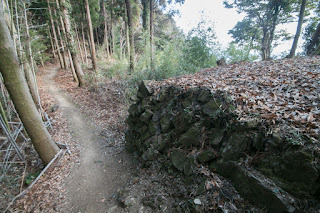 But in addition to the lack of legitimacy because of killing his master, hasty centralization of Harukata attracted dissatisfaction among former retainer of Ouchi clan. 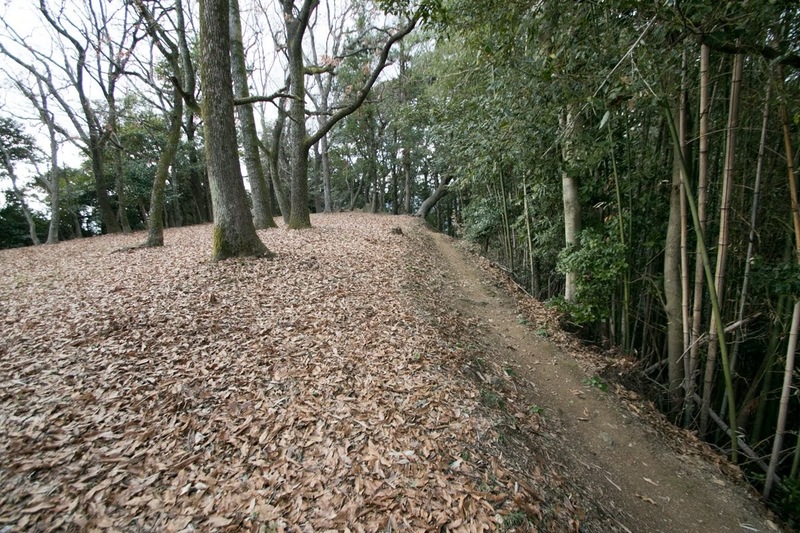 In 1554, Yoshimi clan which was closer to former Ouchi clan raised his army, and Motonari Mouri looked at this situation also rebelled against Harukata at Aki province. 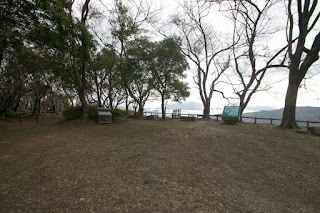 Motonari captured whole Aki province and built Miyao castle (Hiroshima prefecture) at Itsukushima island as a defense line against Sue army. 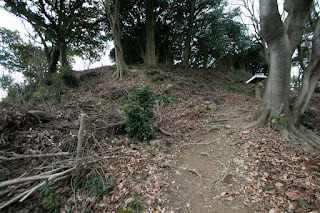 Facing the leave of Motonari, Harukata sent his general to Mouri clan but was totally defeated. 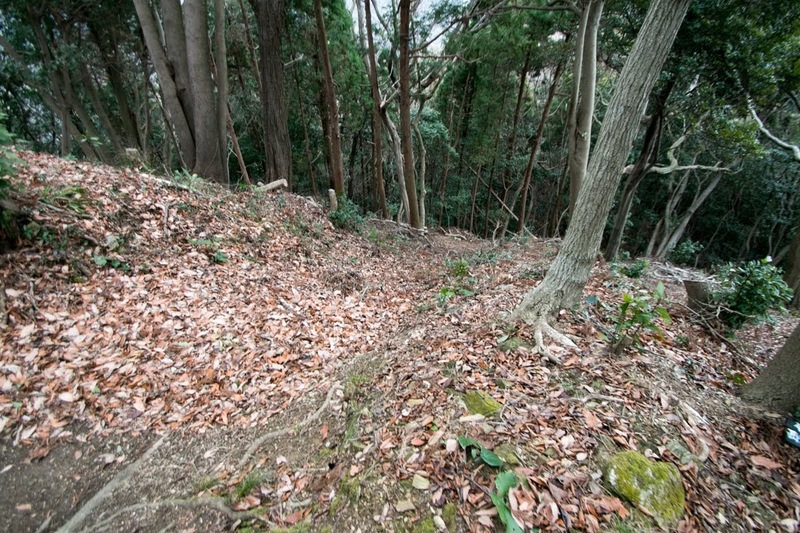 Looking at this, Harukata lead whole 20,000 army to attack Mouri clan. 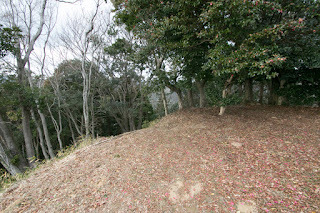 Facing dominant army, Motonari who had only 5,000 army sent a rumor that Fusahide Era (1515-1555), an intelligent general under Harukata, planned to leave Harukata, thus Harukata purged Fusahide. 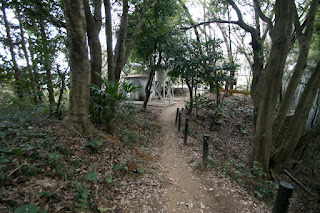 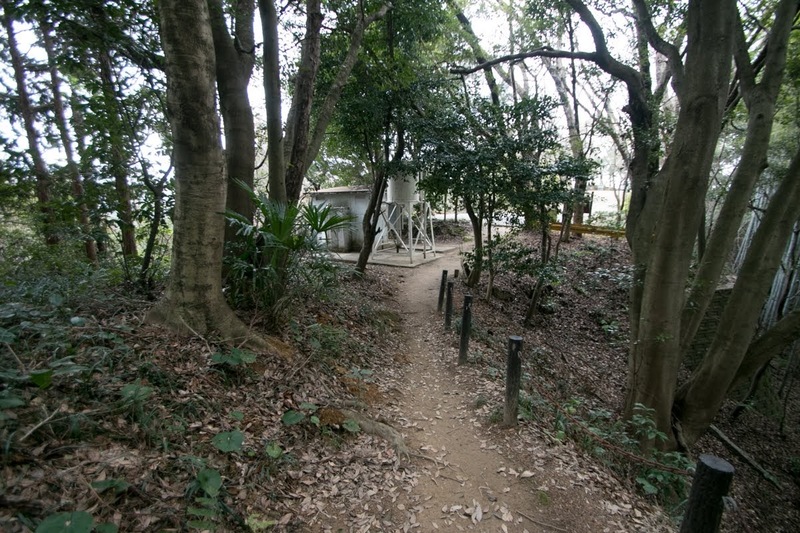 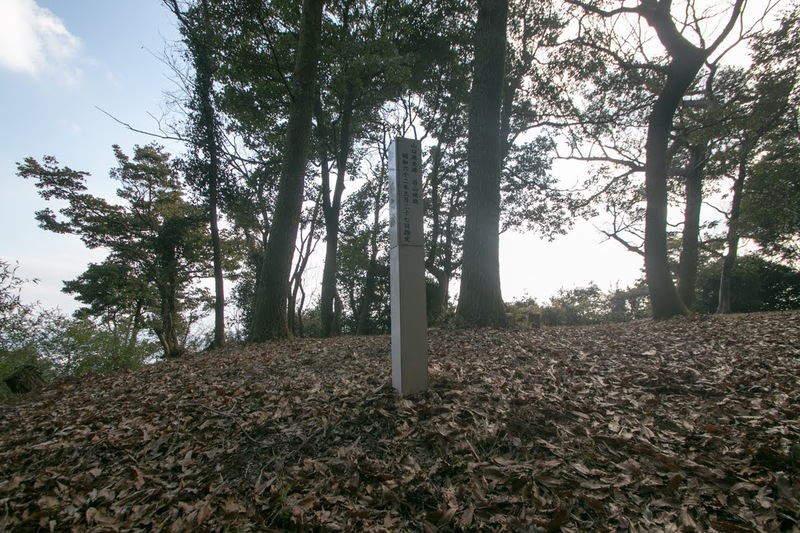 Furthermore, Motonari also intentionally leaked information to Harukata that Miyao castle was a small but vital castle for Mouri clan, thus Harukata landed narrow Itsukushima island where he could not use numerical advantage. 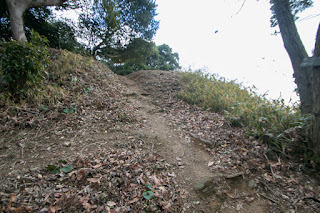 But if Harukata ignored Miyao castle and marched into Aki province, Mouri army at Sakurao castle could cut the supply line of Sue army thus in any case Harukata had to fall Miyao castle. 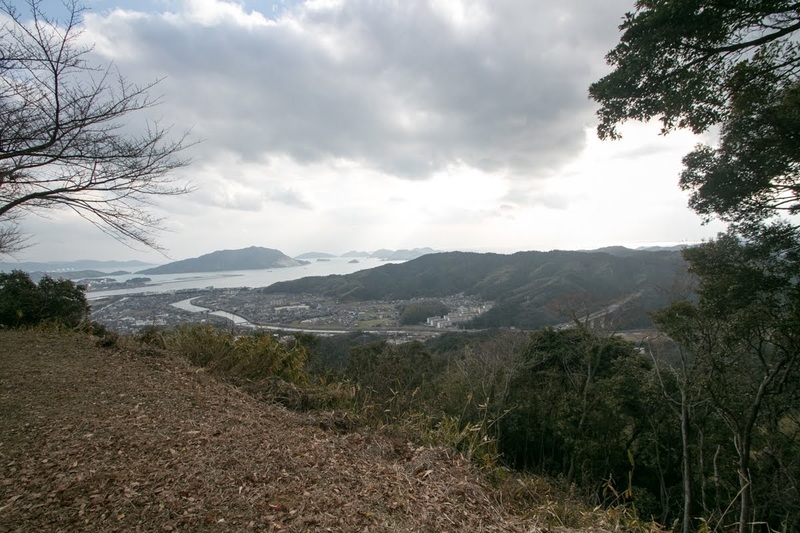 In October, during the storm Mouri army landed to Itsukushima island being assisted by naval army of Murakami clan and secretly stayed at higher place of the island. Next morning Mouri army made a sudden attack, and Sue army was taken by surprise and fell into disorder. Harukata tried to leave from island but all ship was lost by Murakami naval force, thus Harukata finally killed himself. This battle of Itsukushima was regarded as three famous sudden attack, along with the battle of Okehazama and battle of Kawagoe castle. Straightforward character of Harukata brought decisiveness at rising and good result, but also worked as a weakness at the battle against craftiest Motonari Mouri. On the other hand, Motonari formerly subordinated to Ouchi clan could utilize the result of Harukata's rebellion and rise to the ruler of Chugoku region without notorious reputation. 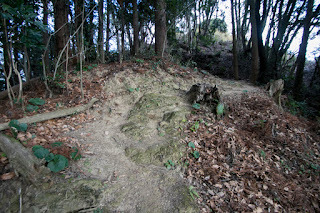 However, Harukata surely left his name at the history by vivid rebellion and defeat. 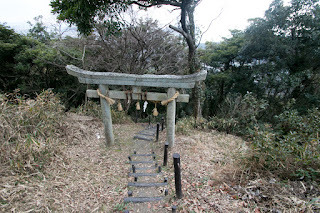 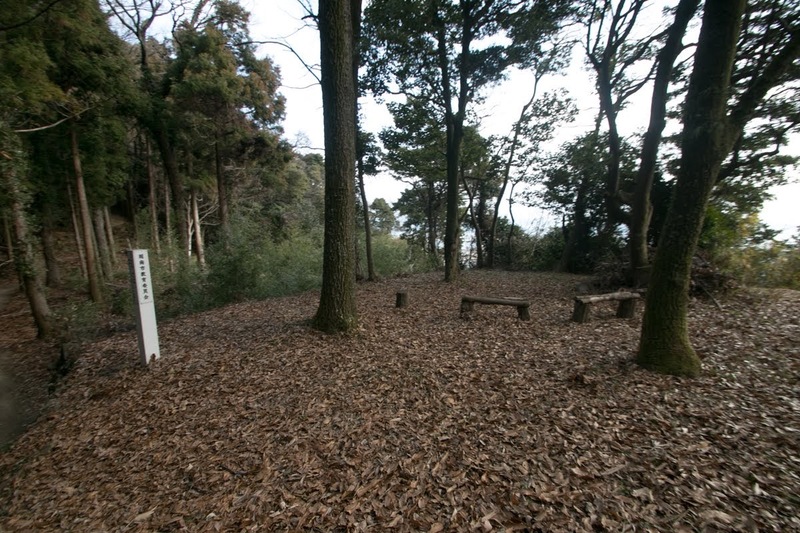 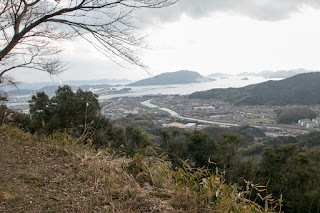 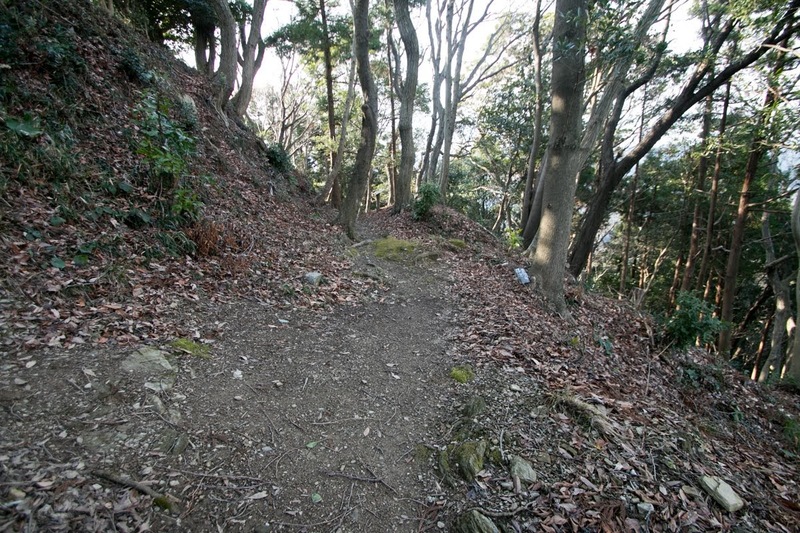 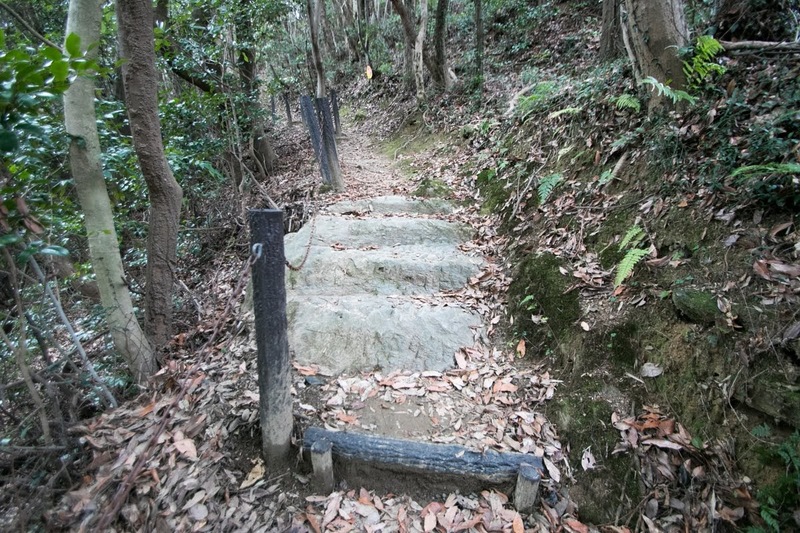 After the battle of Itsukushima, Mouri clan started to intrude into former Ouchi territory. 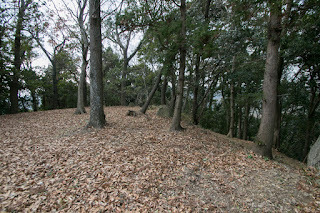 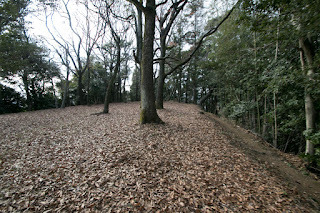 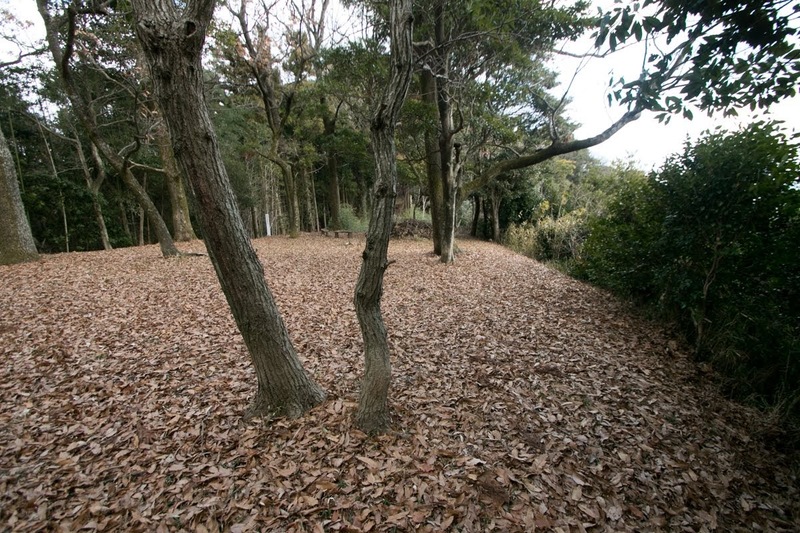 Suo Wakayama castle stood over one year, but finally fell by Mouri army in 1557 and was abolished. 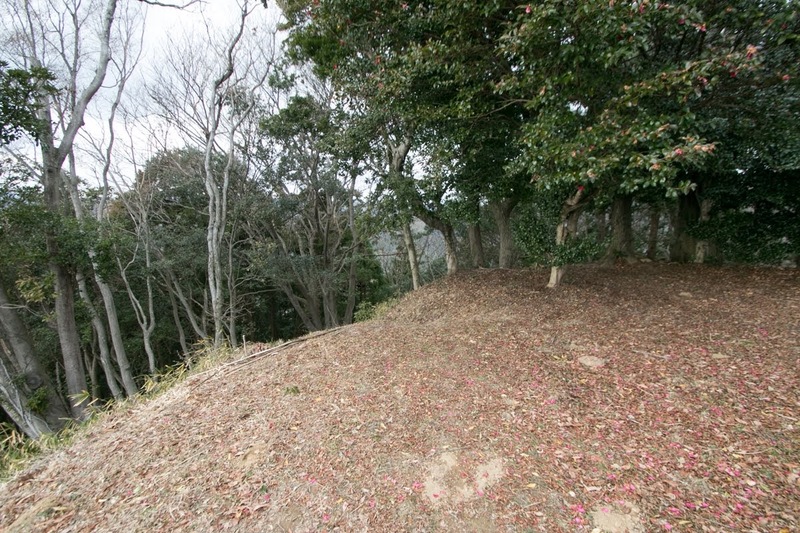 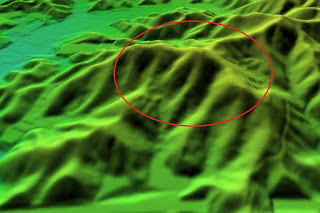 Now all building was lost but structure of the castle still remain on the mountain and castle site is used as a local park. 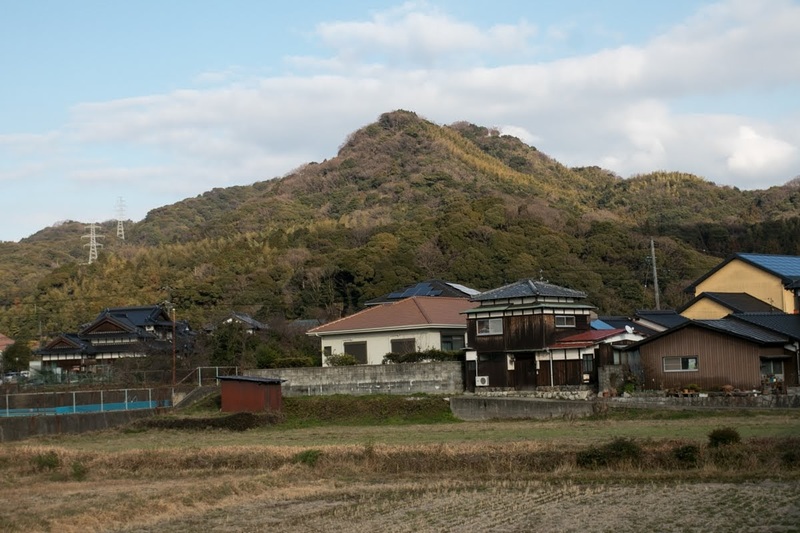 A straight line of areas spread over magnificent corned shape of the mountain well expresses strong but too straight character of its lord. 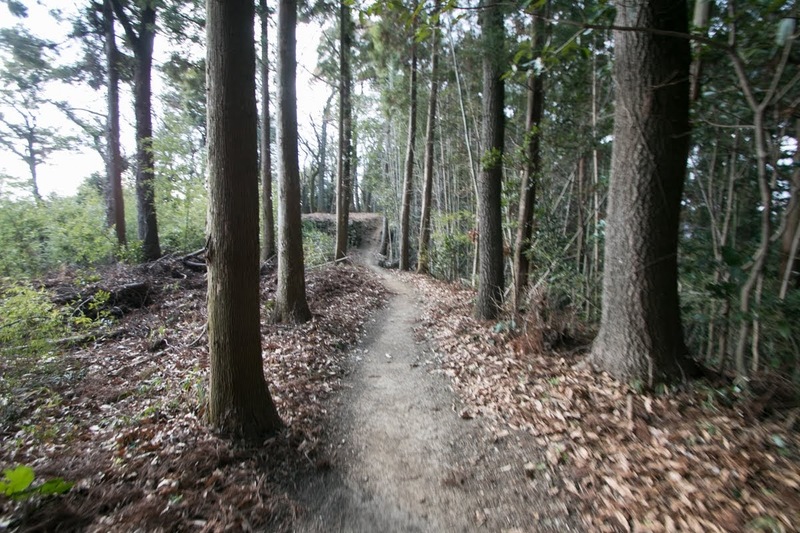 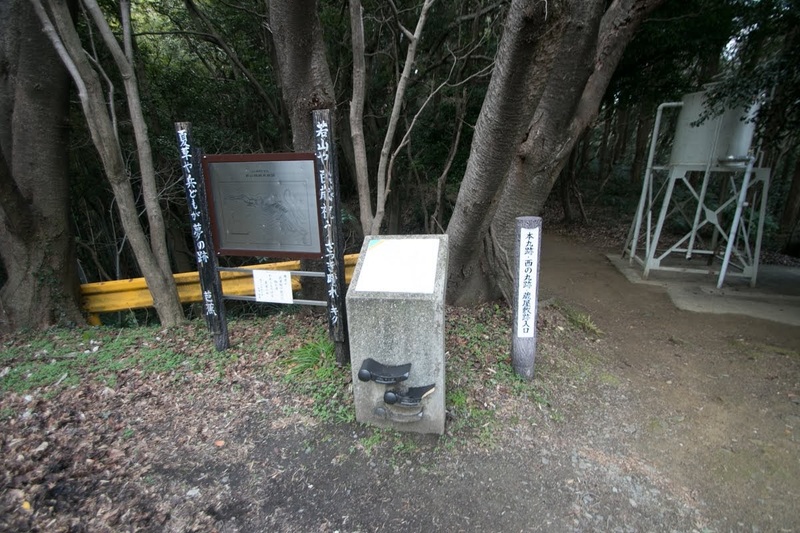 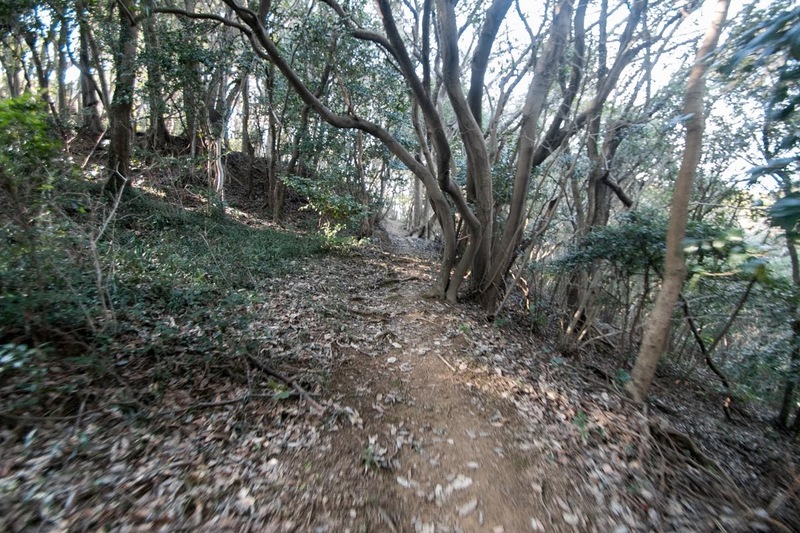 30 minutes walk from JR West Sanyo-Honsen line Fukukawa station. 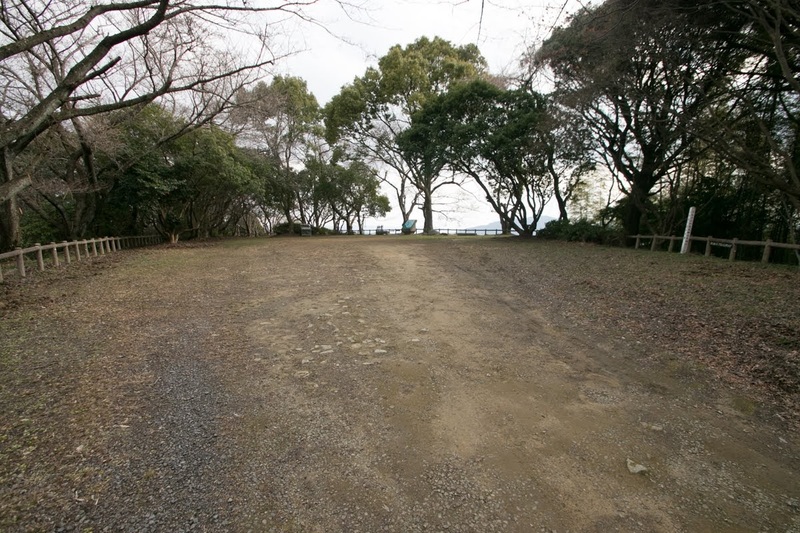 15 minutes drive from Sanyo Jidoshado Expressway Tokuyamanishi interchange.